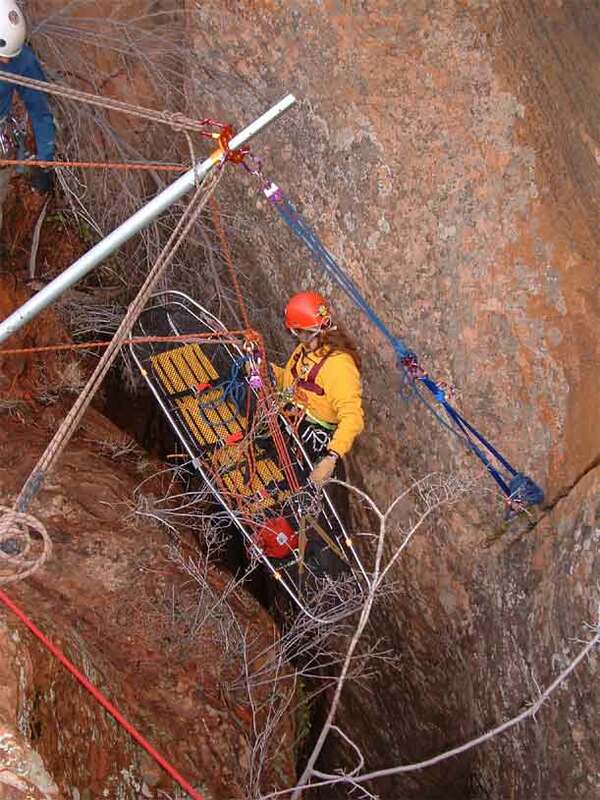 Zion National Park SAR team member descending with litter into narrow slot canyon. 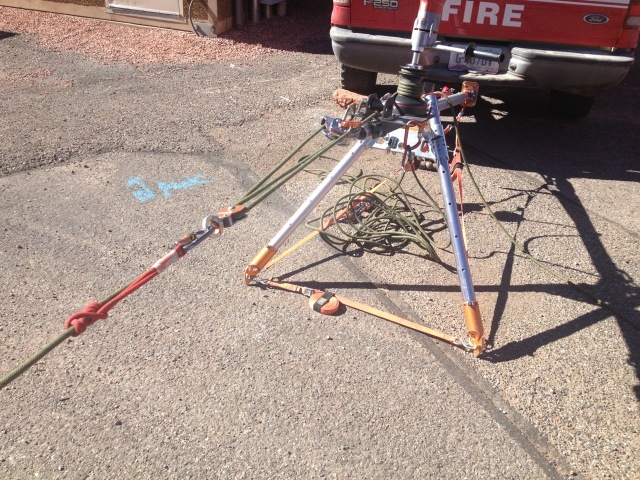 Arizona Vortex delta guyed gin pole used as high directional. 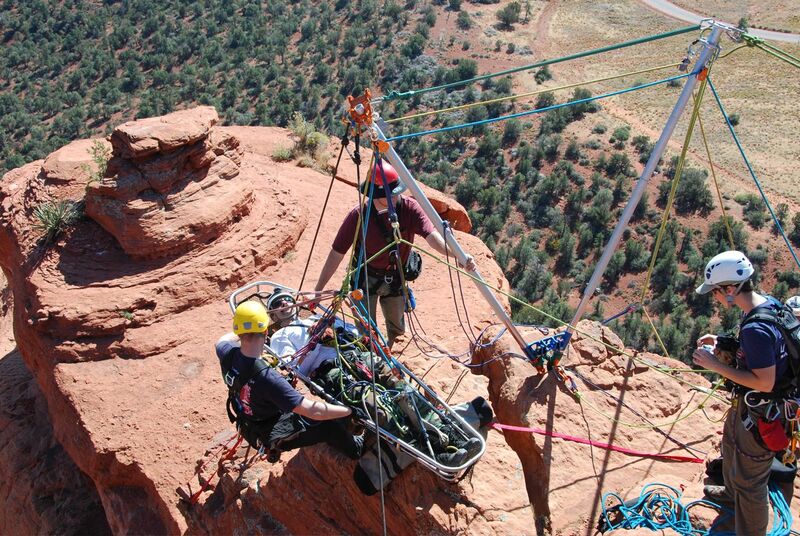 Right AZTEK guy is held by rock pro in sandstone crack. Reed Thorne instructing the physics of the set up on right. 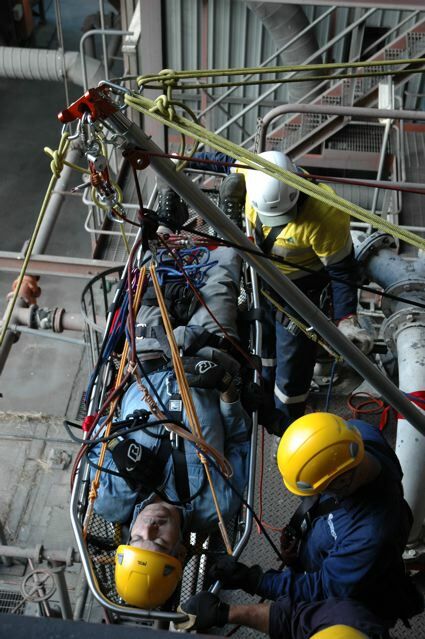 2008 Industrail Rescue Workshop in Biloela, Queensland, Austalia. 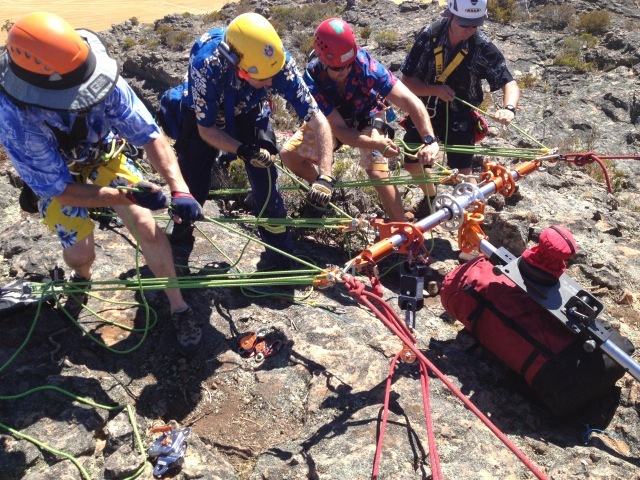 Rescuers from all over Australia construct the Arizona Vortex gin pole using quad guying for litter evolutions over a hand rail at the Callide A Power House. 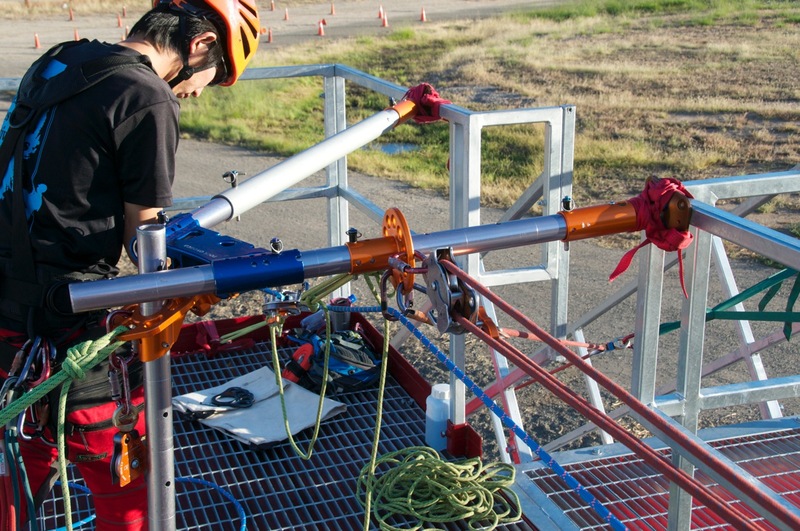 A gin pole used for a deflection line offset during 2008 Industrail Rescue Workshop in Biloela, Queensland, Austalia. 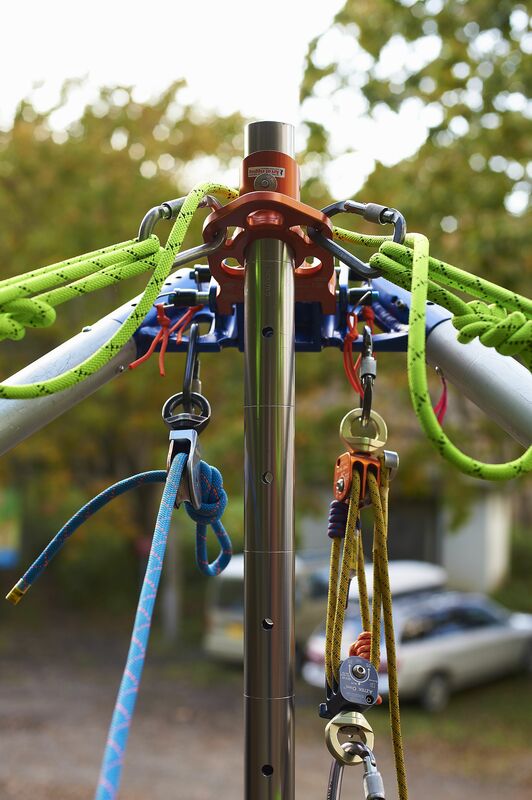 The pulley system here is a compound 6:1 notated (3:1cd) x (1:1) x (1:1 at gin pole) x (2:1) at left blue carriage. 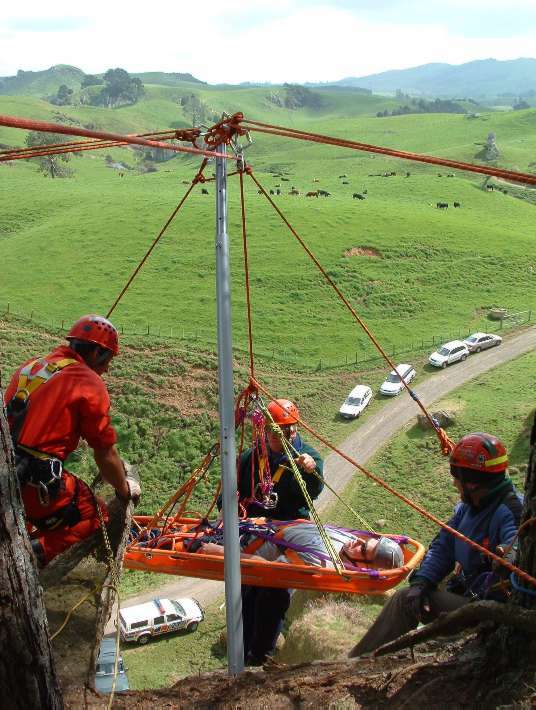 New Zealand Team Skills Rescue Workshop course in 2006 showing an almost textbook gin pole set up with quad guying. 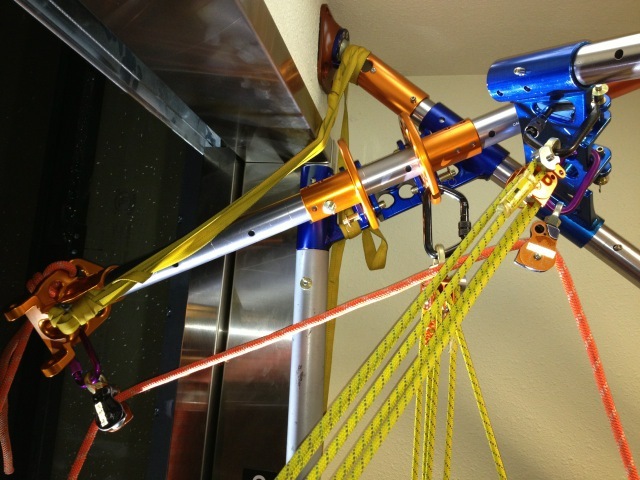 Gin pole for Seattle Fire custom RTR workshop in 2005 showing 4 AZTEK set of fours used for tandem AHD set up on Seattle Port Cranes. 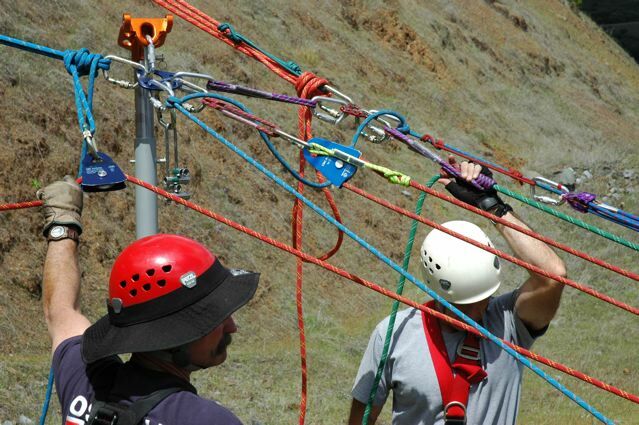 During the 2008 Roseville, Team Skills Rescue Workshop rescuers used a gin pole to keep rigging off of ground in clever arrangement. 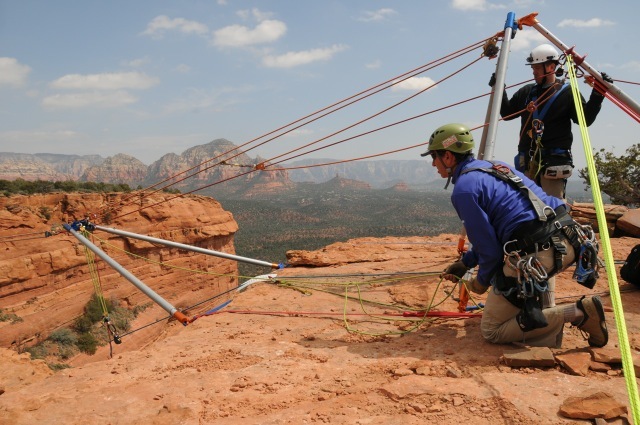 Gin pole used in Sedona, Arizona Advanced Skills Rescue Workshop in 2008. Top carriage is holding twin trackline highline. 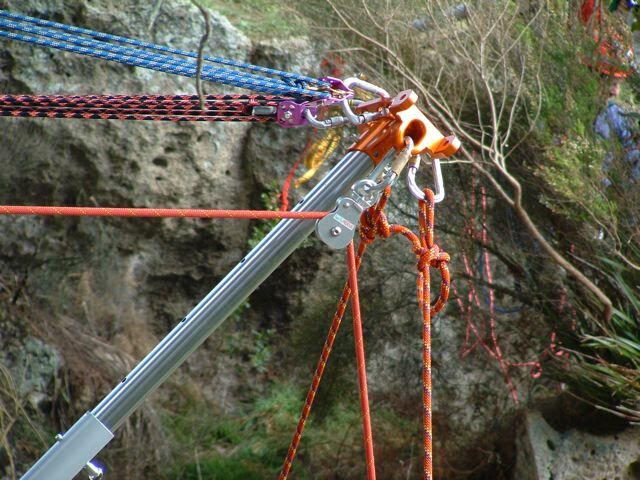 Bottom two pulleys are (1) tagline, and (2) reeve line. 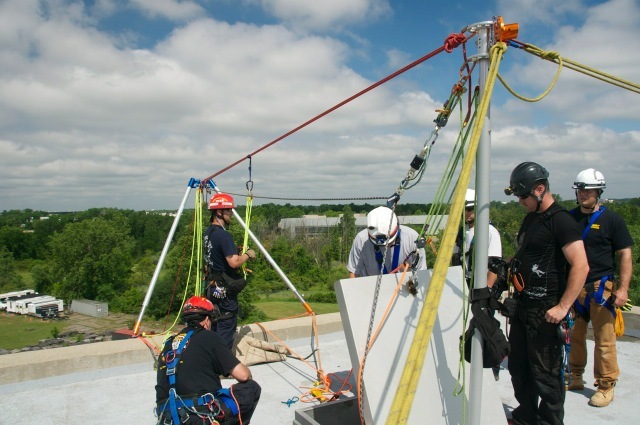 During the 2008 Roseville, Team Skills Rescue Workshop rescuers used square lashing to mount a sideways gin pole to keep main line oriented on the Forest Hill Bridge. 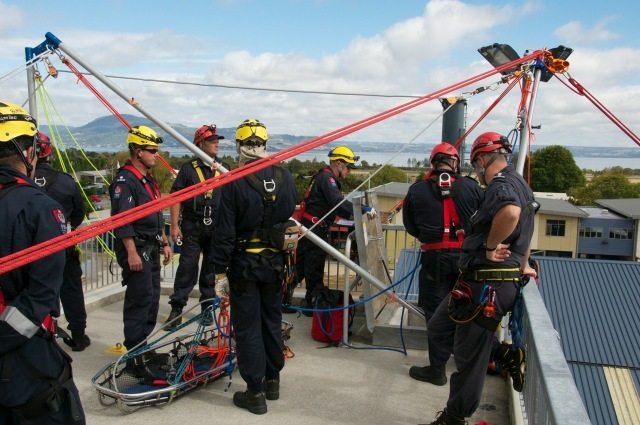 This AZORP topped gin pole was constructed by New Zealand Fire Service instructors at the Rotorua National Fire Training Center in a two week course by Reed Thorne in 2014. 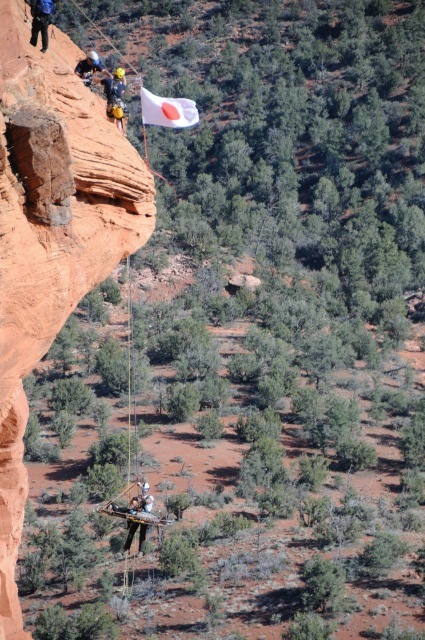 Japanese Flag on Gin Pole at "Nose"
Japanese students in custom program in Oak Creek Canyon erect delta guyed gin pole over the edge of Doe Mountain proudly displaying their flag. The "Nose" of Doe Mountain, seen here, is over 500' overhanging to the ground! 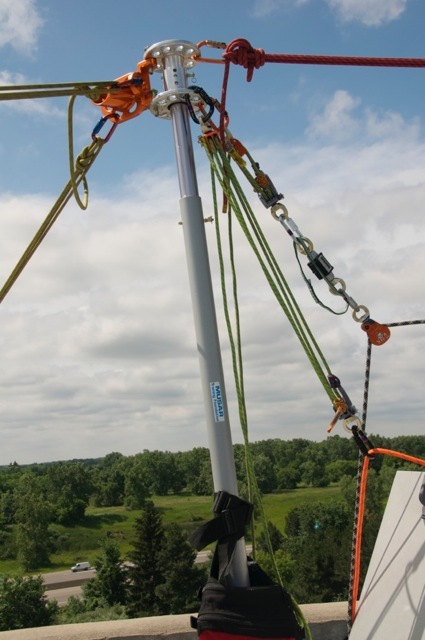 This gin pole is using the AZORP head prototype for the Michigan AHDW (Artificial High Directional Workshop) in 2012 with Reed Thorne and Dave Van Holstyn. 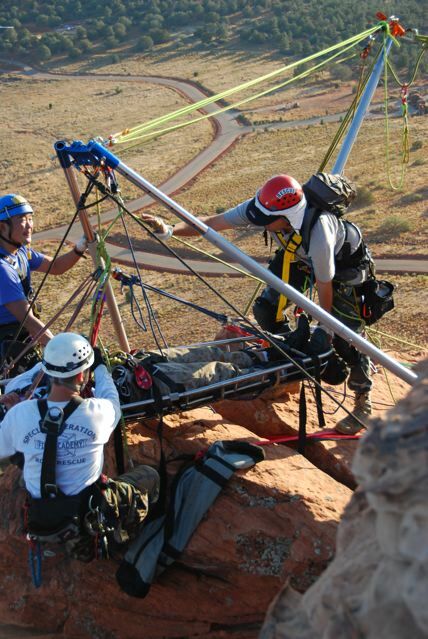 "V" Frame used in Sedona, Arizona Advanced Skills Rescue Workshop in 2008. This is virtually an upside down A Frame with quad guying; 2 guys off of each leg (total 4) and a tensioning element in between the two legs on top (AZTEK set of fours). 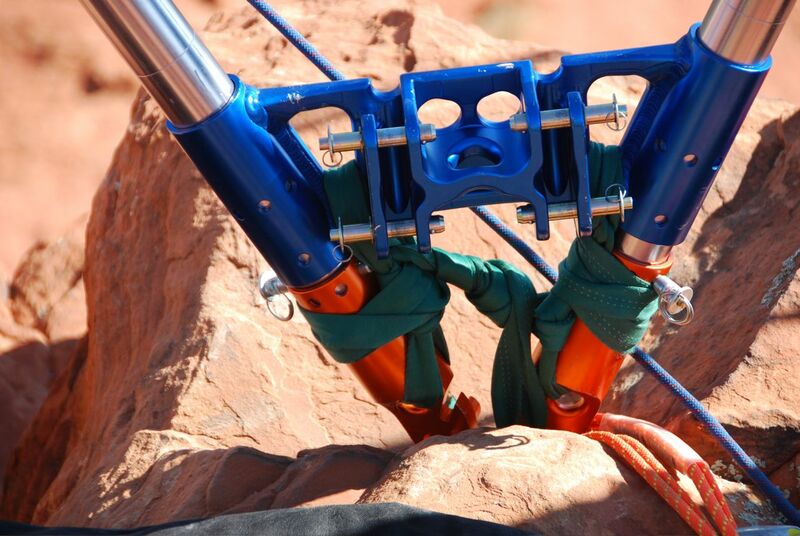 The V Frame foot consisting of 2 Raptor feet and the blue A Frame (blue) Joiner from the Arizona Vortex. Not optimal in our opinion as it torques the blue head severely, so we went back to the drawing board. See later drawing by Reed Thorne. 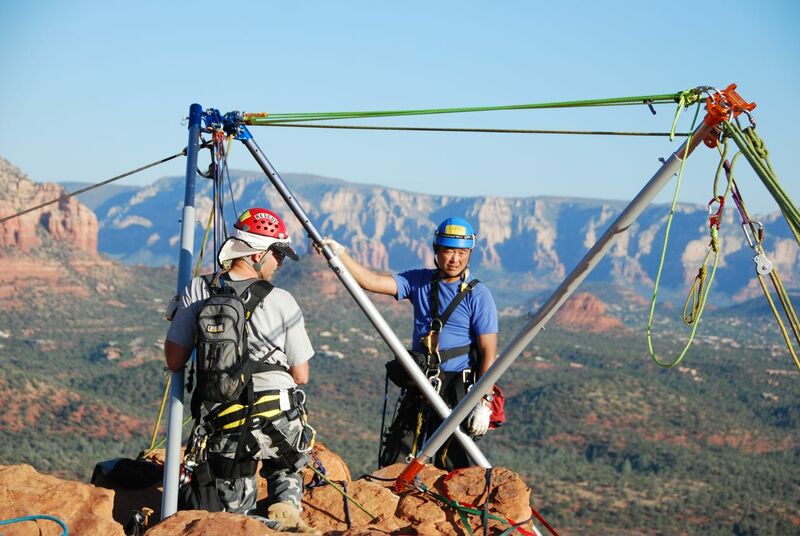 V Frame on Doe Mountain in Sedona, Arizona. 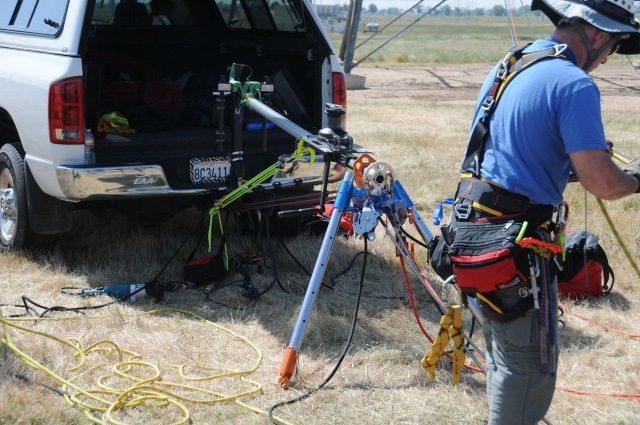 This was our first use of the new adaptor between the raptor feet of the AZ Vortex. 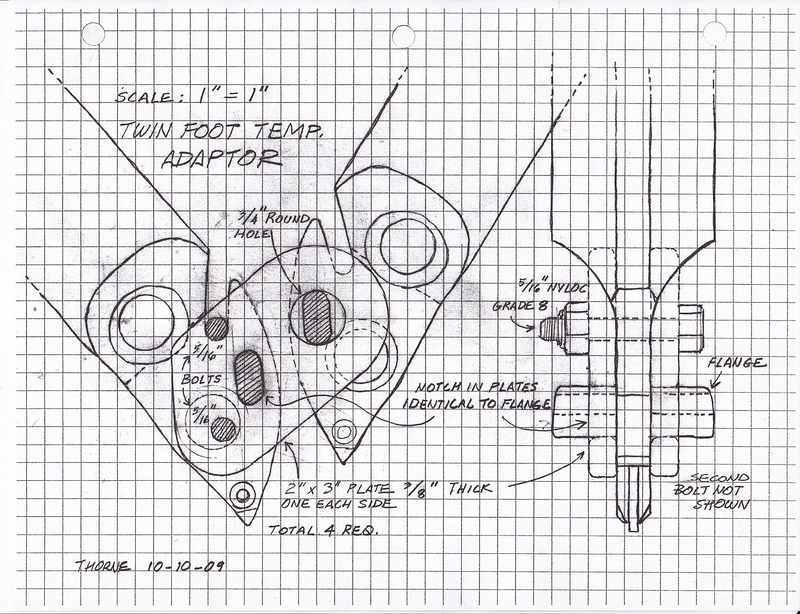 Reed's drawing of Raptor Foot Adaptor which Rock Made in October of 2009. These adaptors are not available from Rock Exotica at this time. 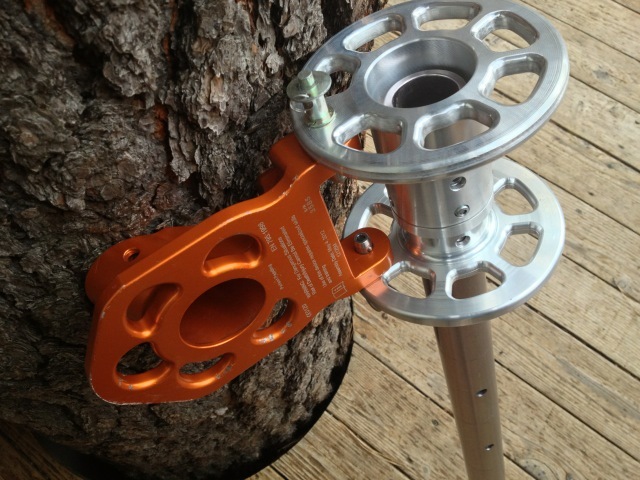 Another view of the Raptor Foot Adaptor. 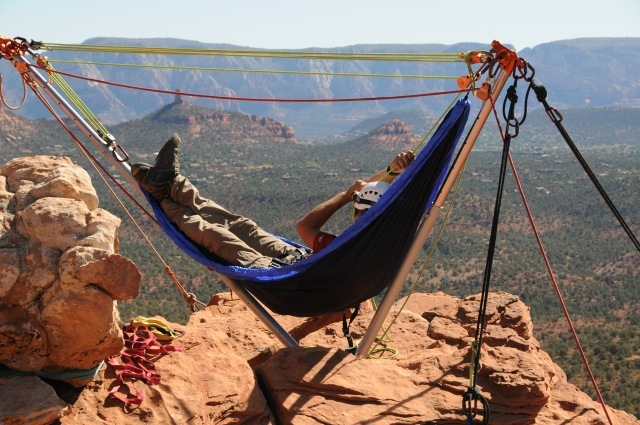 RTR Washington instructor Greg Sobole in hammock fashioned from V frame on Doe Mountain. 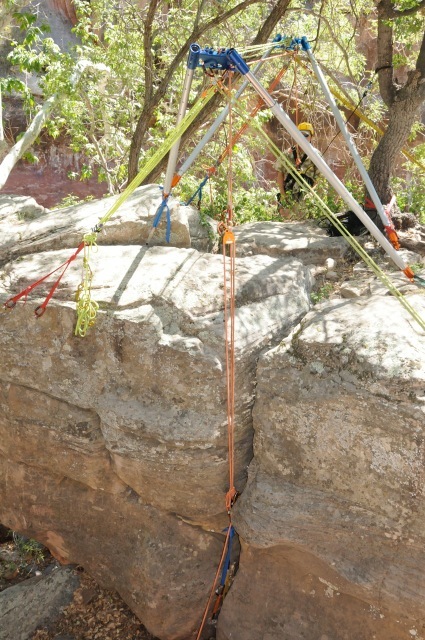 V Frame at Encinoso with Japanese students in 2010 with Ropes That Rescue. The entire frame is held with several AZTEKs. 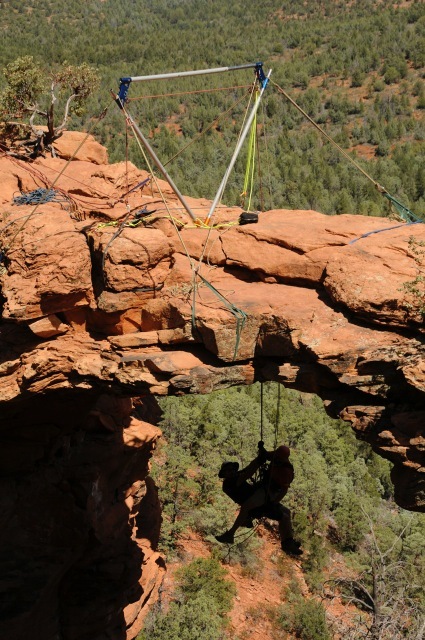 Double "A" Frame used in Sedona, Arizona Advanced Skills Rescue Workshop in 2007. 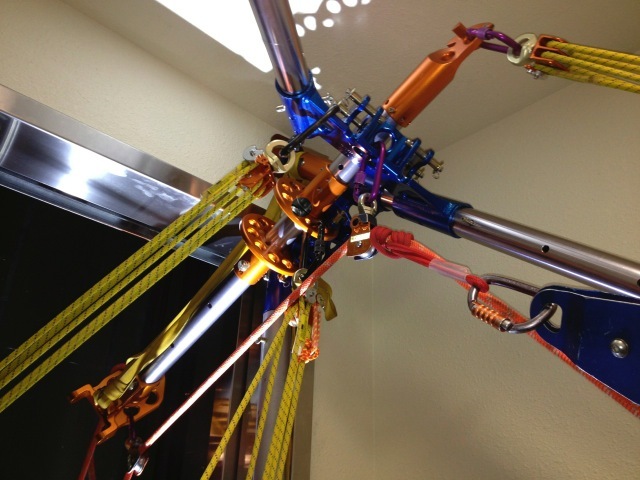 A second AZ Vortex blue and orange head assembly is needed for this double A frame set up. 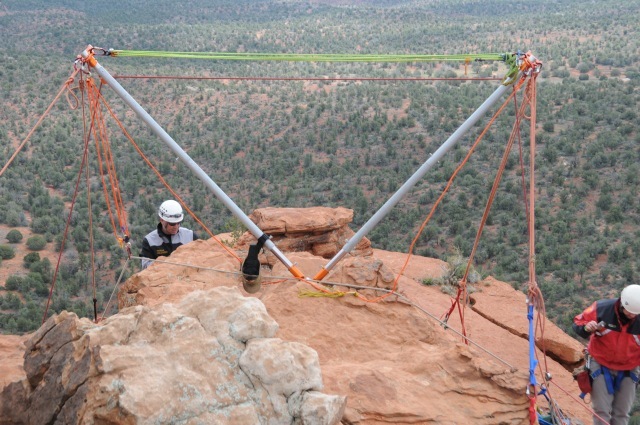 Double "A" Frame used on Bell Rock in Sedona, Arizona ASRW (Advanced Skills Rescue Workshop) in 2007. 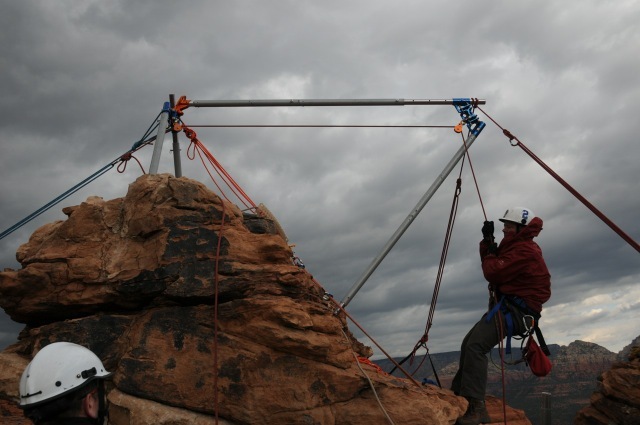 Quad guying is being used (as with the "V" Frame) to secure this artificial high directional on a rock precipice. 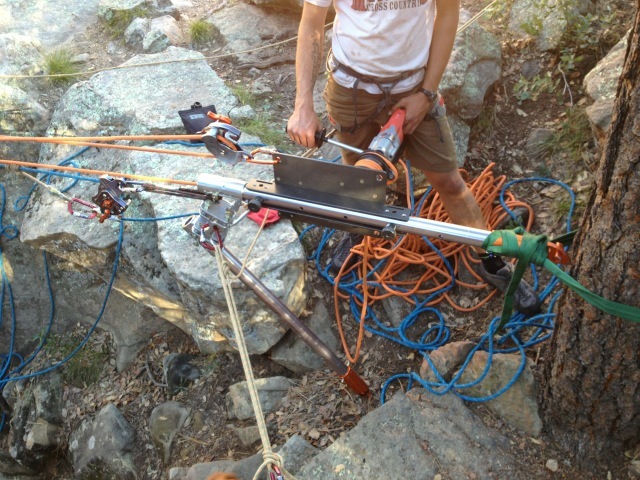 Double A Frame on a rock prominence at Encinoso in Oak Creek Canyon. Here, all AZTEK guying. 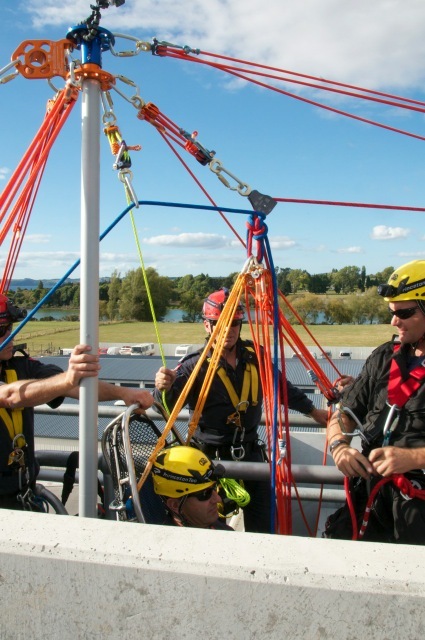 Australian students in the 2014 Blue Mountains OHRW (Offset Highline Rescue Workshop) practice multiple frames at the park headquarters near Blackheath, New South Wales. Here, a Double A Frame clinical setup in a benign setting. 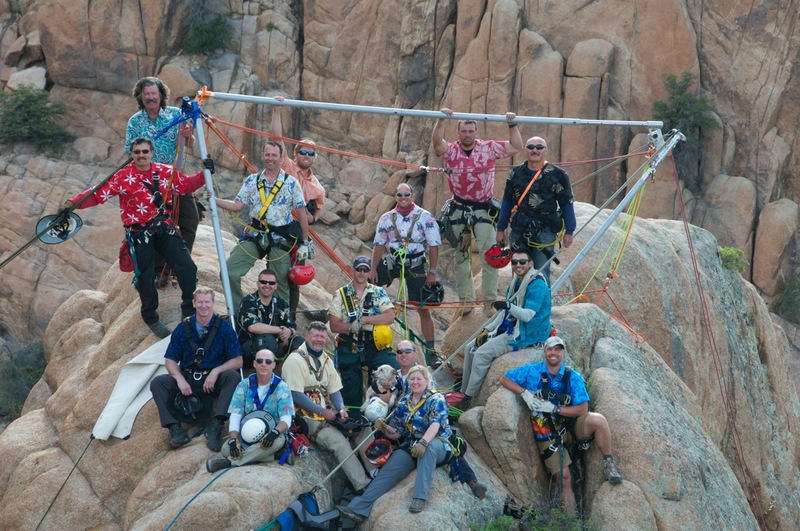 Len Batley, Australian Senior RTR Instructor, and Reed Thorne were instructors. See also "SPECIALTY FRAMES" on this page. 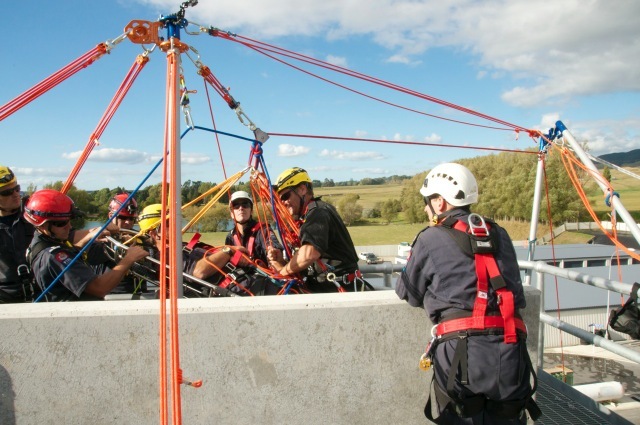 Australian students in the 2014 Blue Mountains OHRW (Offset Highline Rescue Workshop) practice multiple frames at the park headquarters near Blackheath, New South Wales. Here, an A Frame/SA Frame clinical setup in a benign setting. 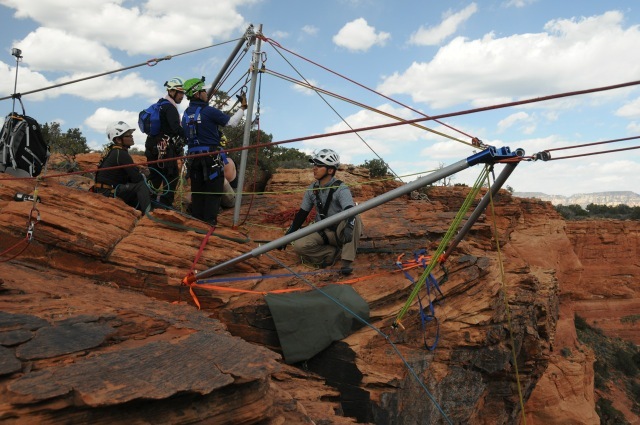 Len Batley, Australian Senior RTR Instructor, and Reed Thorne were instructors. 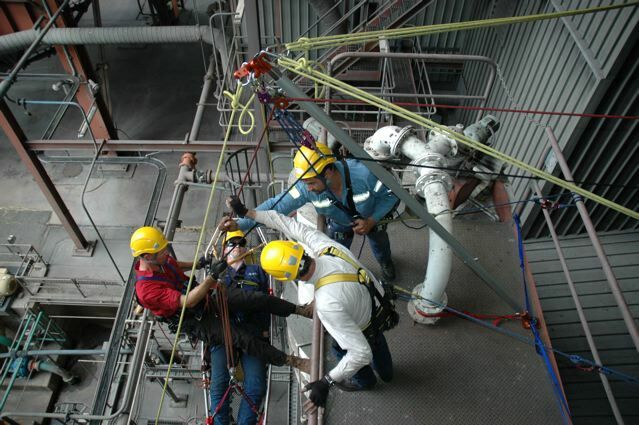 Tandem AHD using the Arizona Vortex for Seattle Fire custom RTR workshop in 2005 showing several AZTEKs used for tandem AHD set up on Seattle Port Cranes. 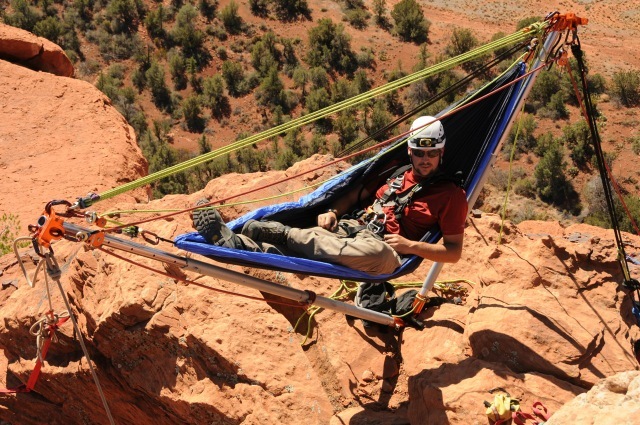 Lead instructor, Keith Thorne, is in litter at age 15. 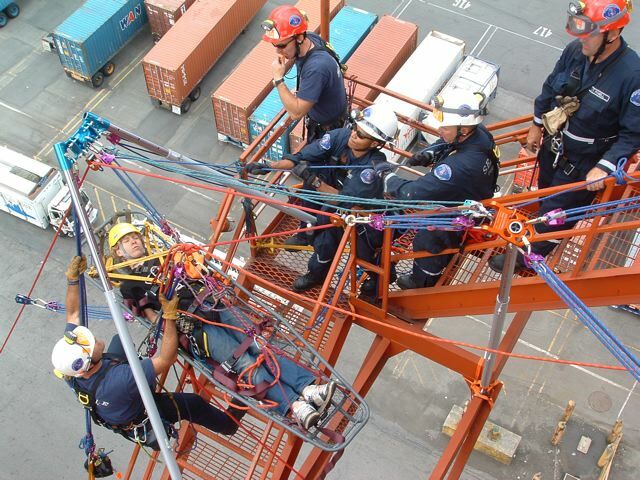 Tandem AHD for Seattle Fire custom RTR workshop in 2005 showing several AZTEKs used for tandem AHD set up on Seattle Port Cranes. 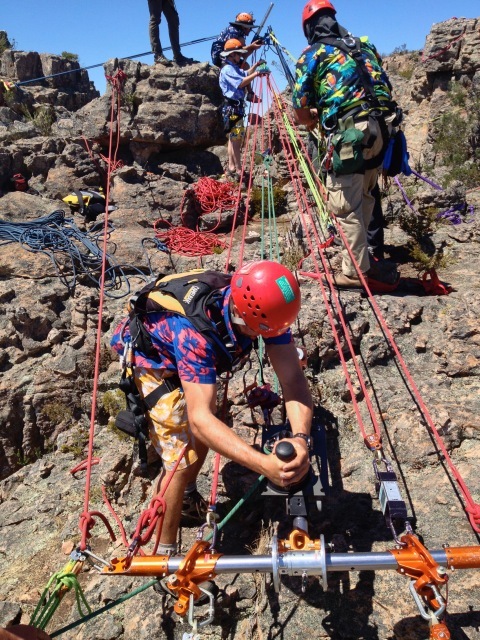 RTR assistant instructor, Keith Thorne, is in foreground in yellow helmet. 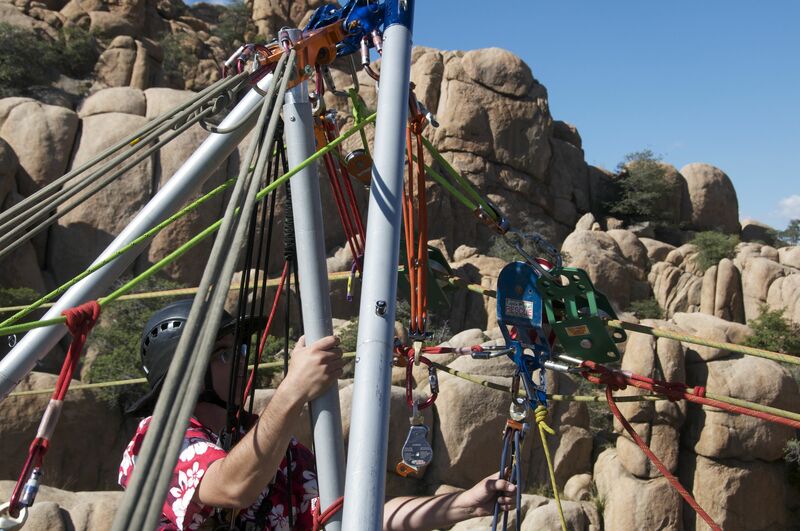 The AZ Vortex was used here to build the first, so named, "Watson Wishbone" (WWB) frame during the October 2015 ASRW (Advanced Skills Rescue Workshop) at the Granite Dells' Watson Lake Dam. 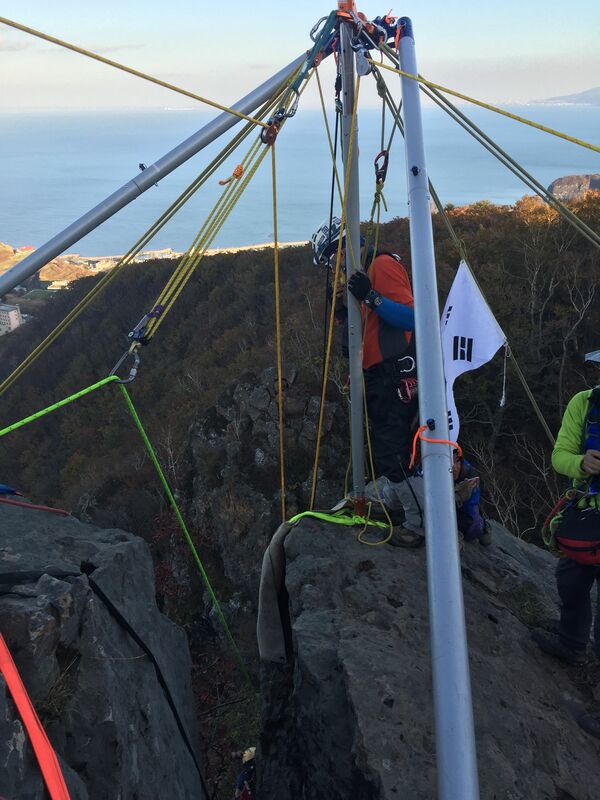 Here the WWB is used as a litter bypass station on a 100 meter highline with two carriages. 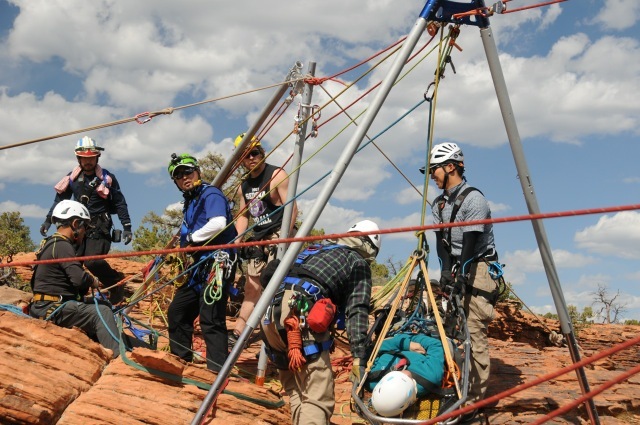 RTR Instructor, and Reed Thorne were instructor. 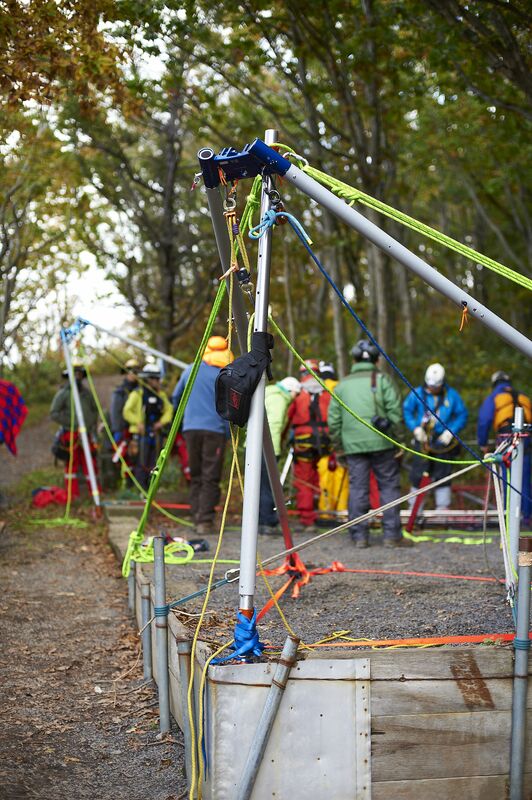 The AZ Vortex was used here to build the second, so named, "Watson Wishbone" (WWB) here set up in a parking lot near Otaru, north island of Japan (near Sapporo) RTR Instructor, Reed Thorne was instructor. 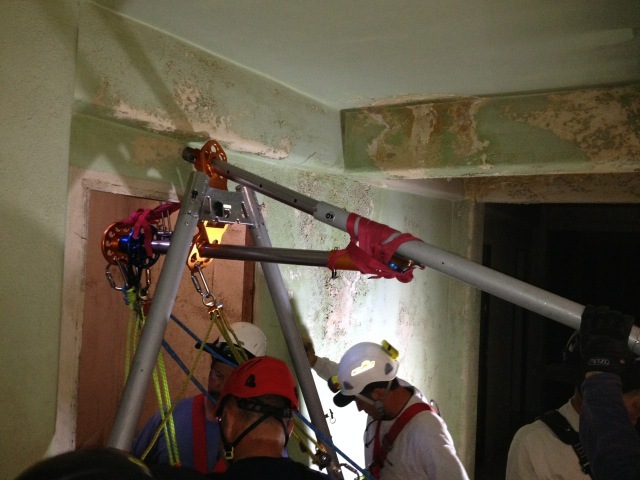 Students in the 2014 IRW (Industrial Rescue Workshop) use an unusual combination of a standard easel A frame hooked at the rear to a short gin pole which was used as main anchor for bringing the victim up the stairwell through a second SA frame inide the door at rear. Lots of guying in this evolution at Precott Valley Convention Center. 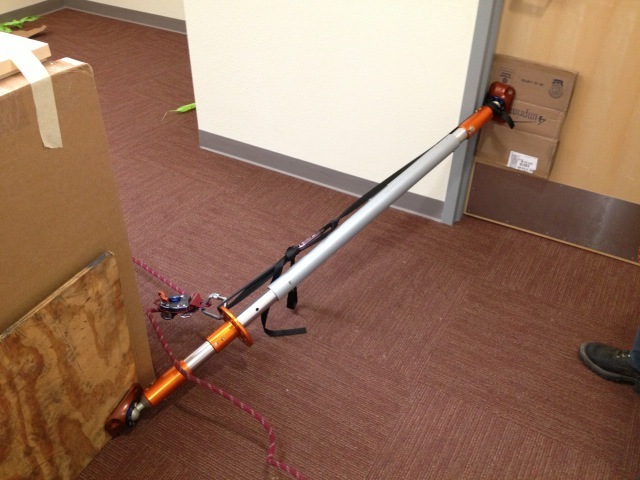 Close up of combo gin pole and guying. View forward toward the edge where the litter and attendant will be lowered over the edge after coming up the stairwell. With an all Japanese "contingent" we built a small combo frame: A frame to the rear anchored front to back, and a side guyed SA frame to the sides. 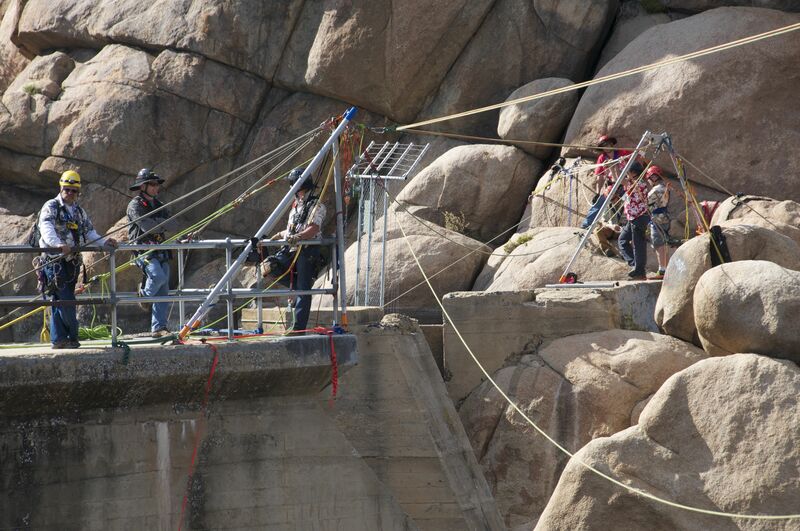 Notice the Skyhook® capstan winch on the rear leg ready for raising and lowering the load off the far right of photo. Watson Frame upright and ready for luffing. Watson Frame Luffed out with Japanese students. 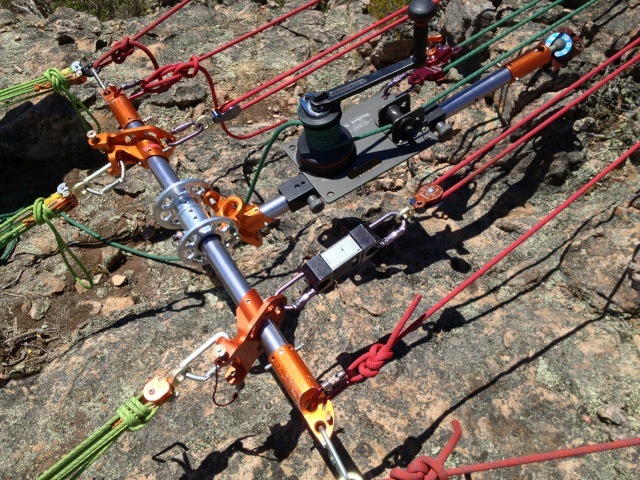 Special coupling made by Rock Exotica for using two AZ Vortex gine pole heads together. 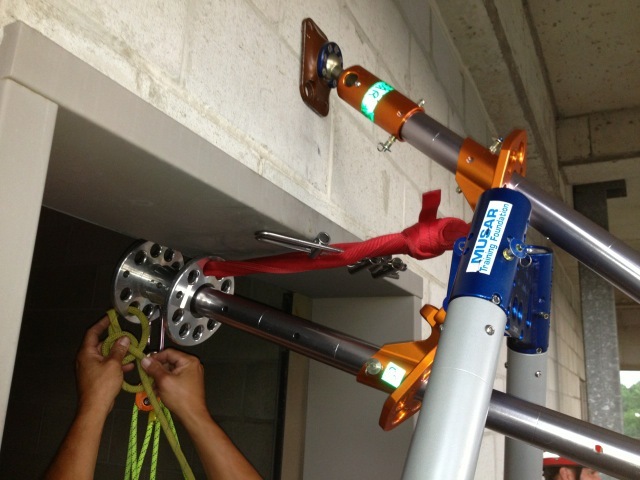 This allows the Watson Frame to articulate at the joint. 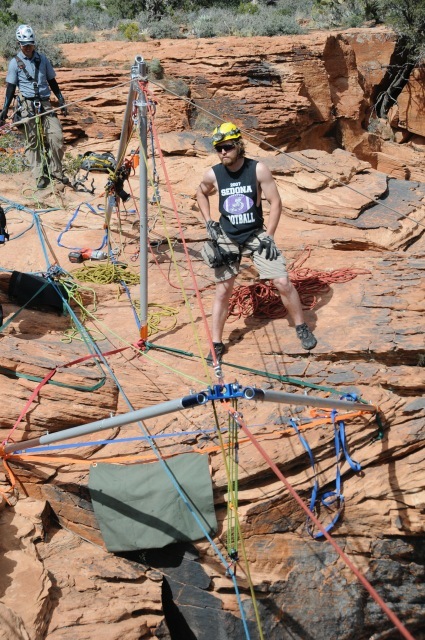 Aussie Frame with tilting cantilevered arm at Overlook in oak Creek Canyon. 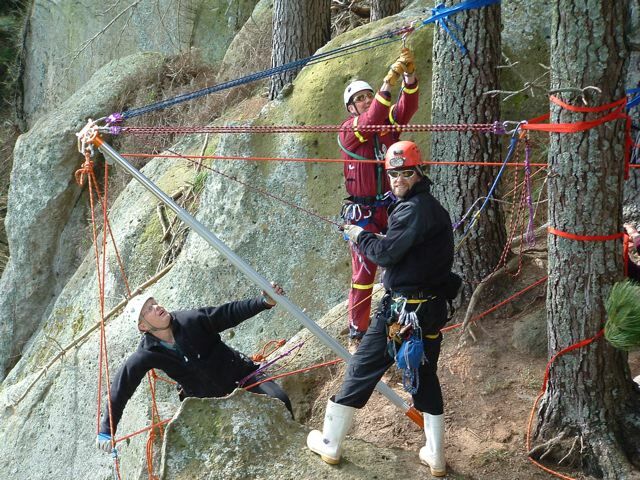 RTR Assistant Instructor Keith Thorne on far right. Creation of Paul Tracogna of Australia! 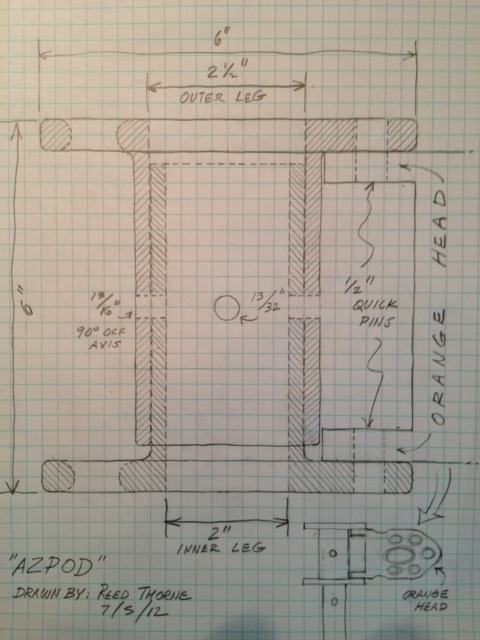 This was dubbed a "Delta Frame" which employed the use of two AZ Vortex blue A frame joiners. Not really a true V frame, this Delta Frame is rigid with a pole between the side. 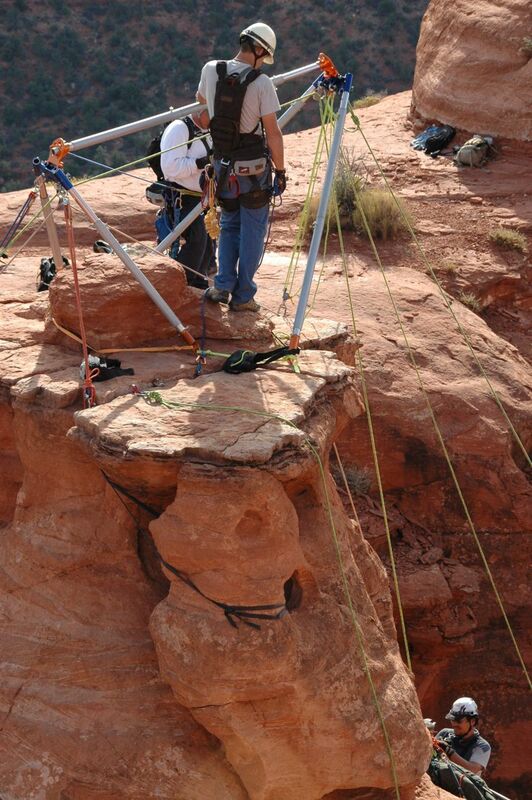 The Delta Frame was constructed on the top of famous Devil's Arch in Sedona, AZ. 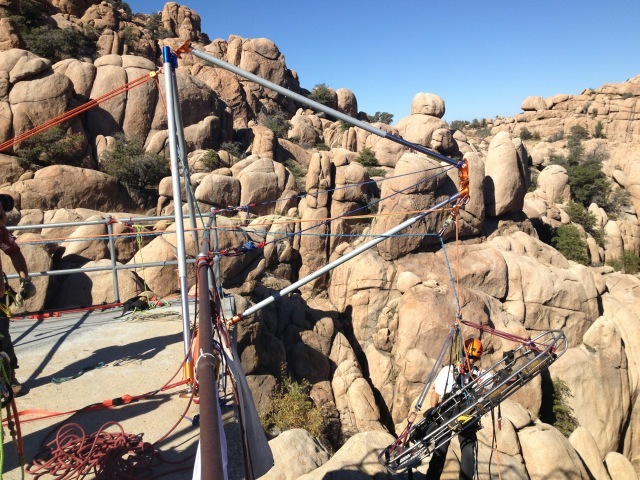 The litter hanging below the Devil's Arch on a Delta Frame. 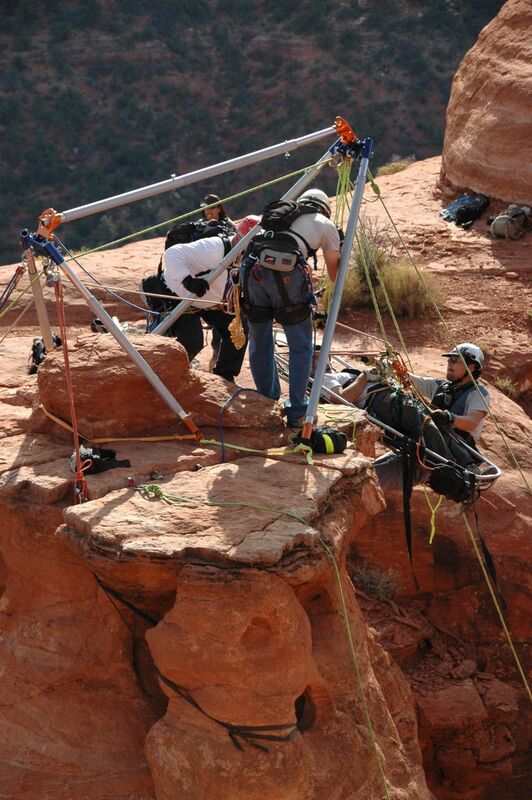 This combo frame was constructed during the 2011 AHDW (Artificial High Directional Workshop) in Sedona, Arizona. The A frame on the left is ready to be luffed out (called "active guying") over the edge with the easel A frame to the right as the anchor/high point. 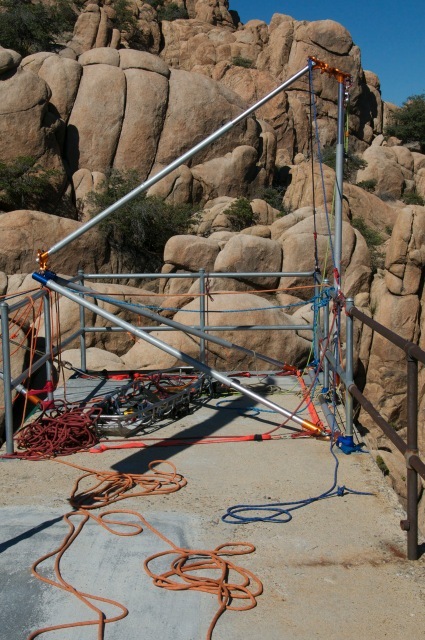 This combo frame was constructed during the 2011 AHDW (Artificial High Directional Workshop) in Sedona, Arizona. The A frame on the left is now luffed out (called "active guying") over the edge with the easel A frame to the right as the anchor/high point. 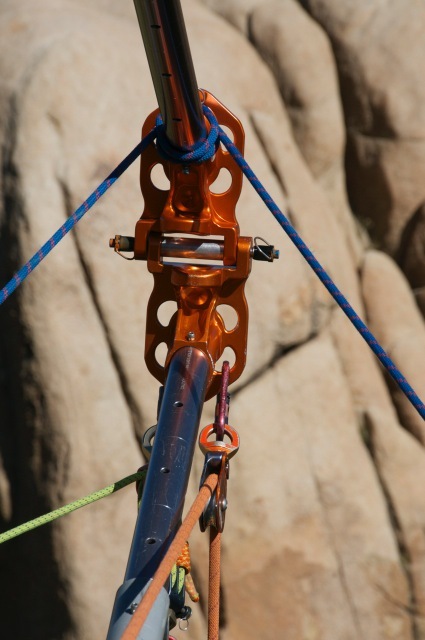 A frame over the edge with "active guying". 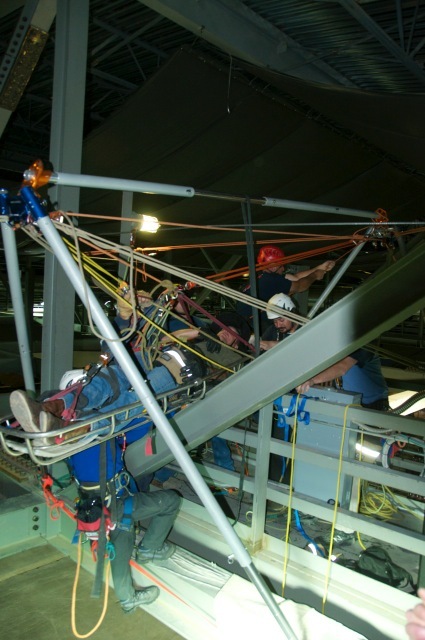 All Japanese custom rigging class in Oak Creek Caynon in 2012. Here the Japanese erected a luffing A frame from the rear SA frame to left of RTR Assistant Instructor Keith Thorne in middle. 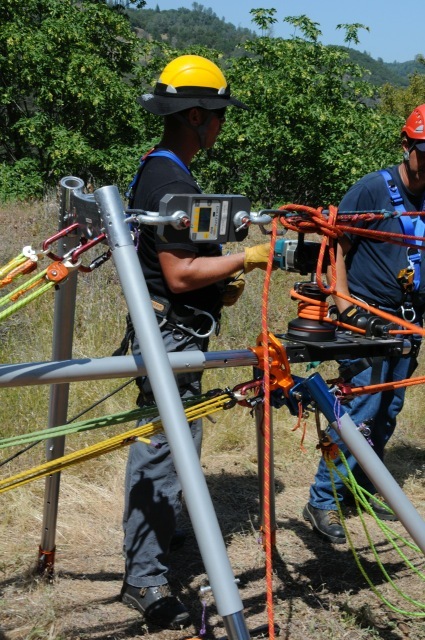 The Skyhook® capstan winch is attached to the rear leg of the SA frame and operated with a cordless drill. Photo taken from opposite side of gap. 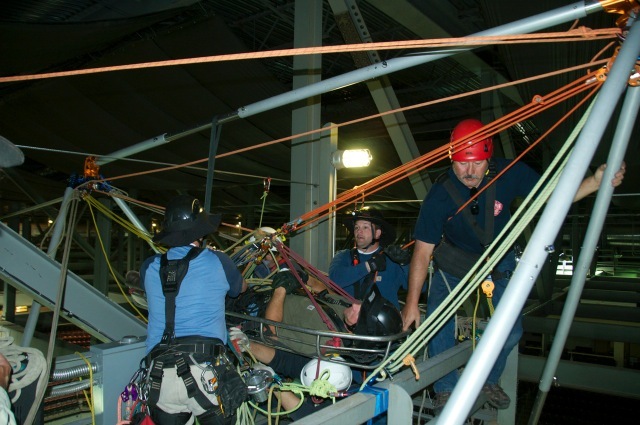 All Japanese custom rigging class in Oak Creek Caynon in 2012. Here the Japanese erected a luffing A frame from the rear SA frame. Seemingly complex structure indeed. Lots of moving parts to this advanced frame. Photo taken from opposite side of gap. 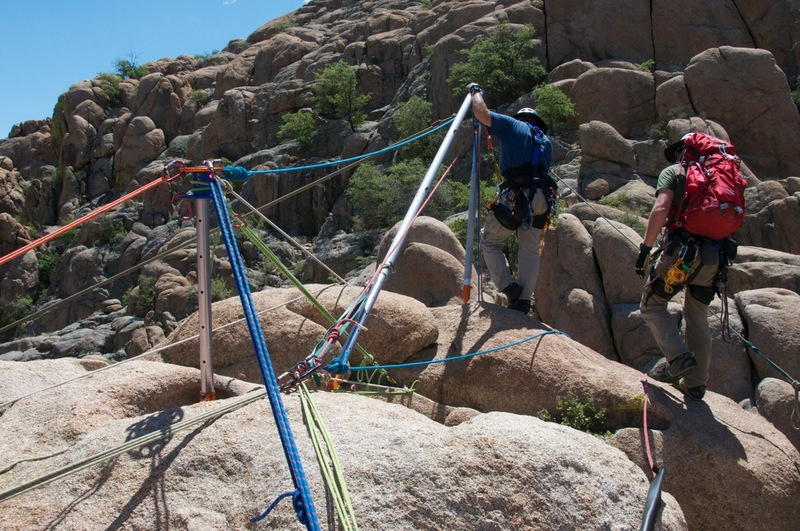 Australian students at the ASRW (Advanced Skills Rescue Workshop) in 2013 at Mount Arapiles, Victoria came up with the "Arapiles T Bar" for anchoring a quad trackline highline tensioning system using three Arizona Vortex kits and a Skyhook capstan winch. 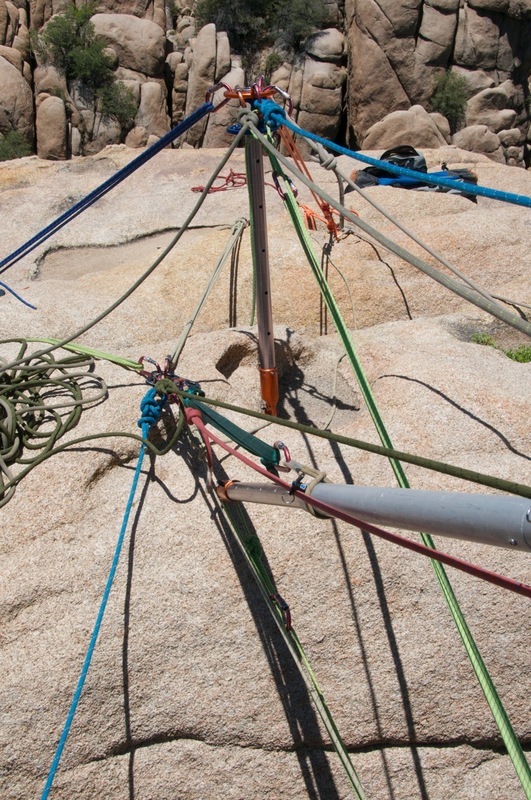 Here, students on four AZTEKs used to pretension the T Bar against opposition anchors. 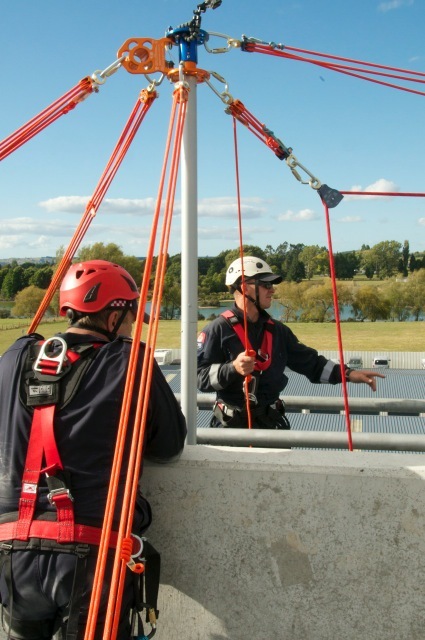 Len Batley, Australian Senior RTR Instructor, and Reed Thorne were instructors. 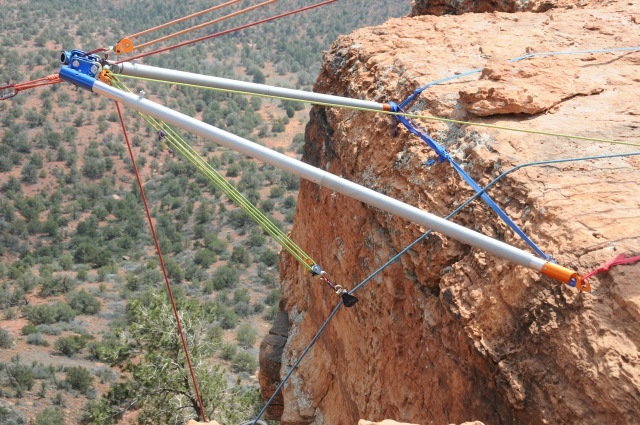 Australian students at the ASRW (Advanced Skills Rescue Workshop) in 2013 at Mount Arapiles, Victoria came up with the "Arapiles T Bar" for anchoring a quad trackline highline tensioning system using three Arizona Vortex kits and a Skyhook capstan winch. 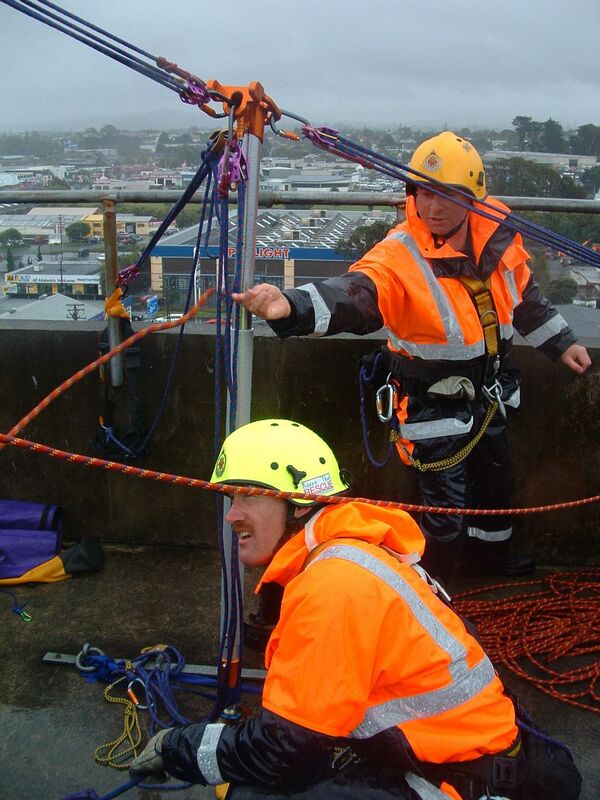 Len Batley, Australian Senior RTR Instructor, and Reed Thorne were instructors. 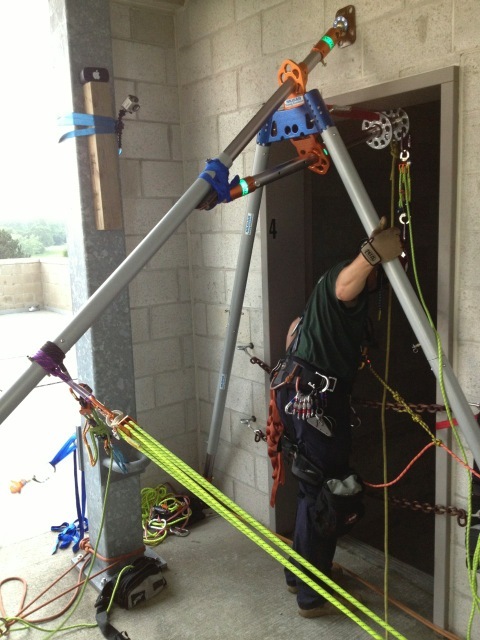 Arizona Vortex Doortex with Sedona Penetrator at elevator shaft in Michigan fire training tower near Lansing. 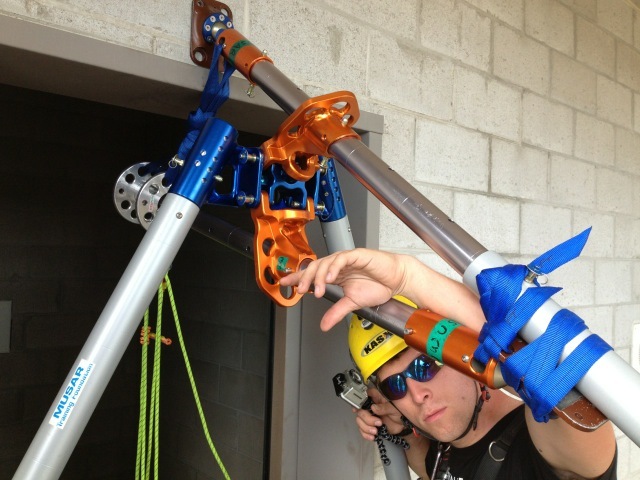 Here, the blue A frame joiner and the orange gin pole head of the AZ Vortex is facing backwards. 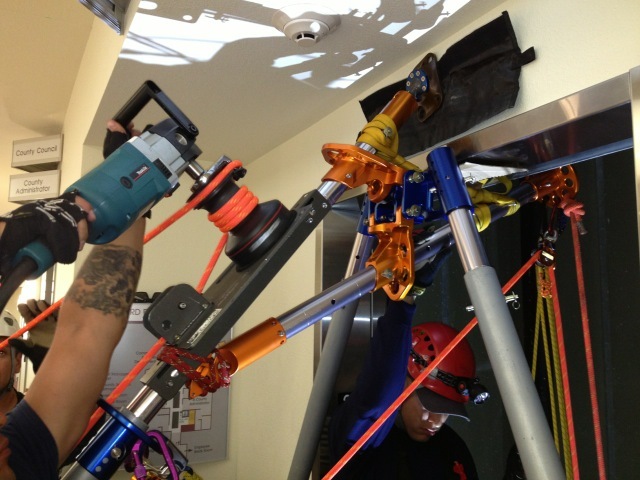 In the next photo, it is facing the opposite way yielding more support for the Sedona Penetrator arm. 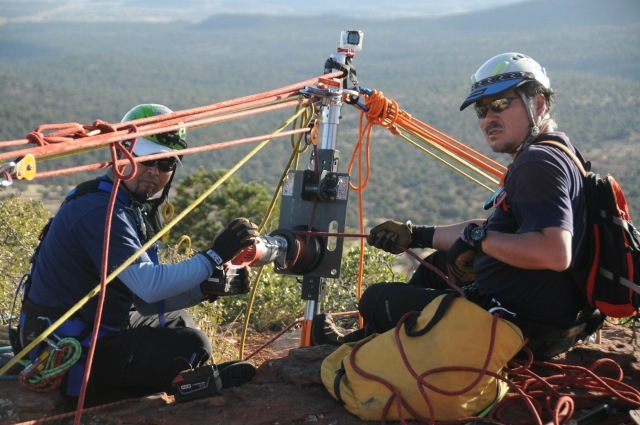 RTR Assistant Instructor Keith Thorne with Arizona "Doortex" with Sedona penetrator during Michigan AHDW (Artificial High Directional Workshop) in 2013. 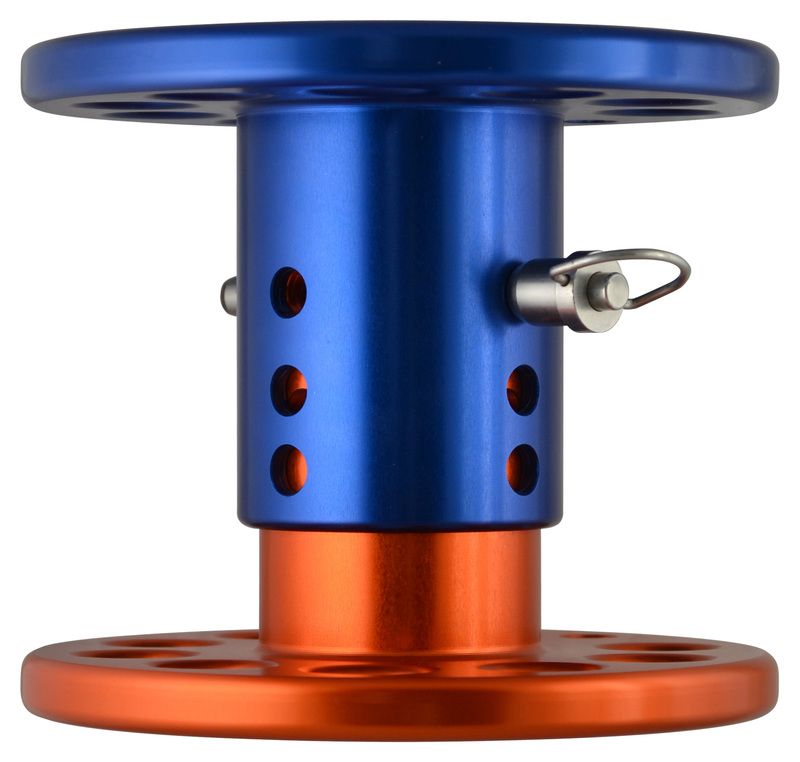 Arizona "Doortex" with Sedona penetrator with Spanish windlass at the head using brake rack Here, the blue A frame joiner and the orange gin pole head of the AZ Vortex is facing forward. 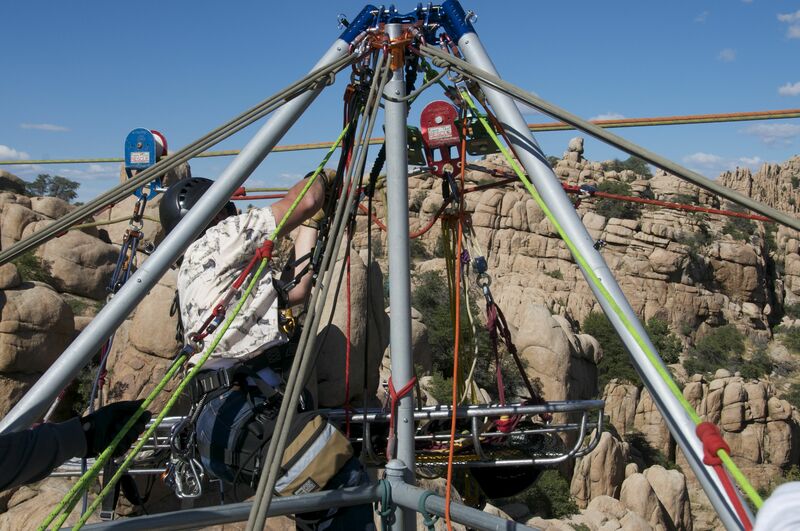 In the preceeding photo, it is facing the opposite way yielding less support for the Sedona Penetrator arm. 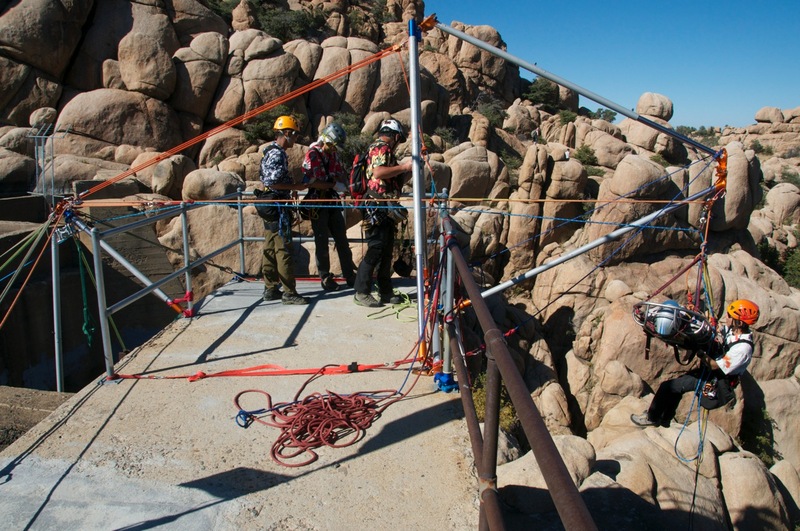 Each year, Jerome Fire hosts the AHDW (Artificial High Directional Workshop) and the abandoned Jerome Hotel is available as a venue for the use by students in building different frames with the Arizona Vortex. 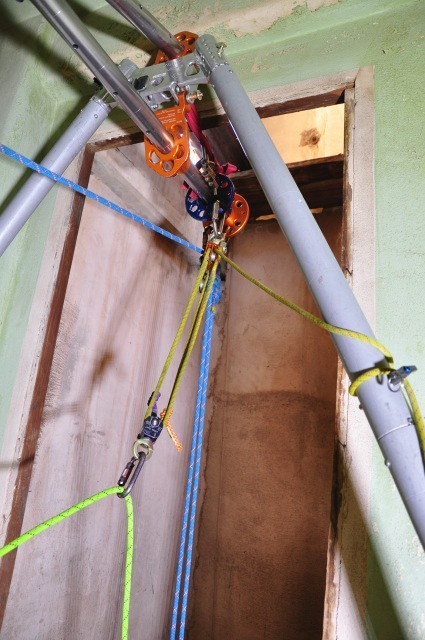 Here the hotel dumb witer shaft is used for the AZ Vortex "Doortex" with the Skyhook® capstan winch and Sedona Penetrator arm inside the shaft. 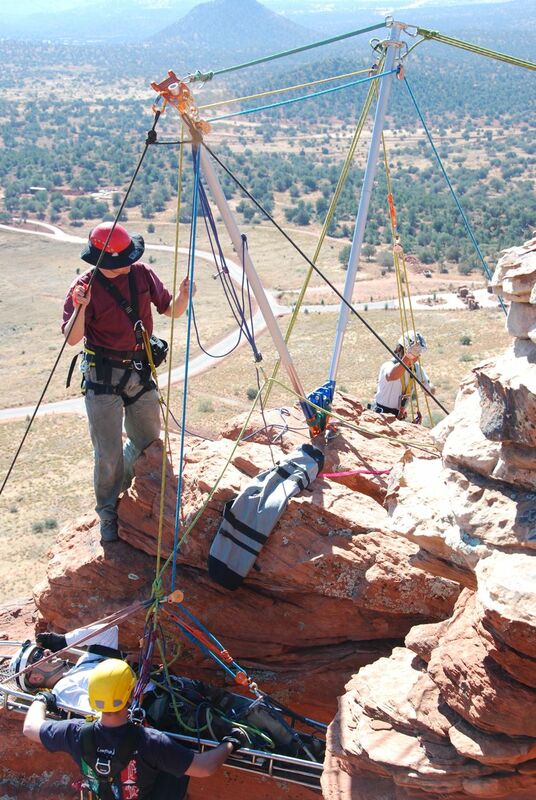 This Jerome venue is ideal because there is no worry to scatching the paint or damaging anything in training. 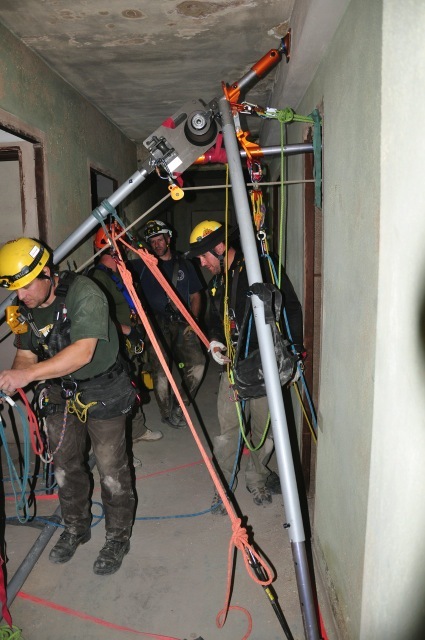 Each year, Jerome Fire hosts the AHDW (Artificial High Directional Workshop) and the abandoned Jerome Hotel is available as a venue for the use by students in building different frames with the Arizona Vortex. 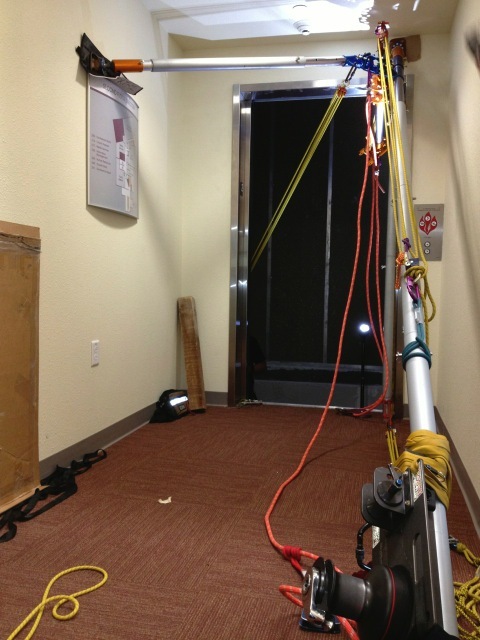 Here the hotel elevator shaft is used for the AZ Vortex "Doortex" with the Sedona Penetrator arm inside the shaft. 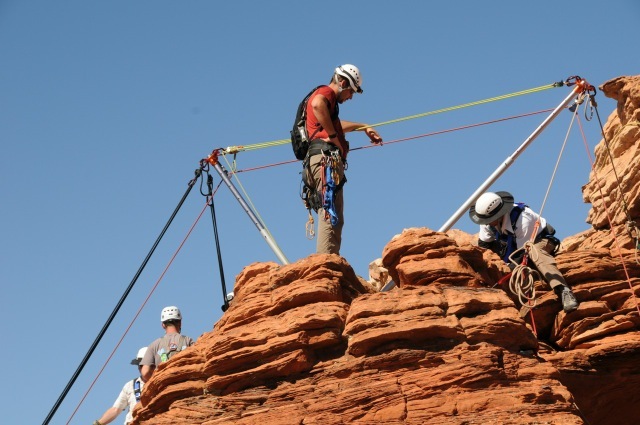 This Jerome venue is ideal because there is no worry to scatching the paint or damaging anything in training. 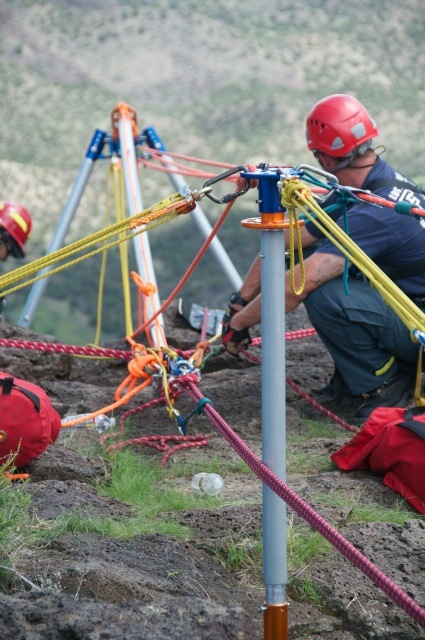 The Los Alamos (New Mexico) Fire Department hosted a custom TSRW (Team Skills Rescue Workshop) RTR program in 2013. 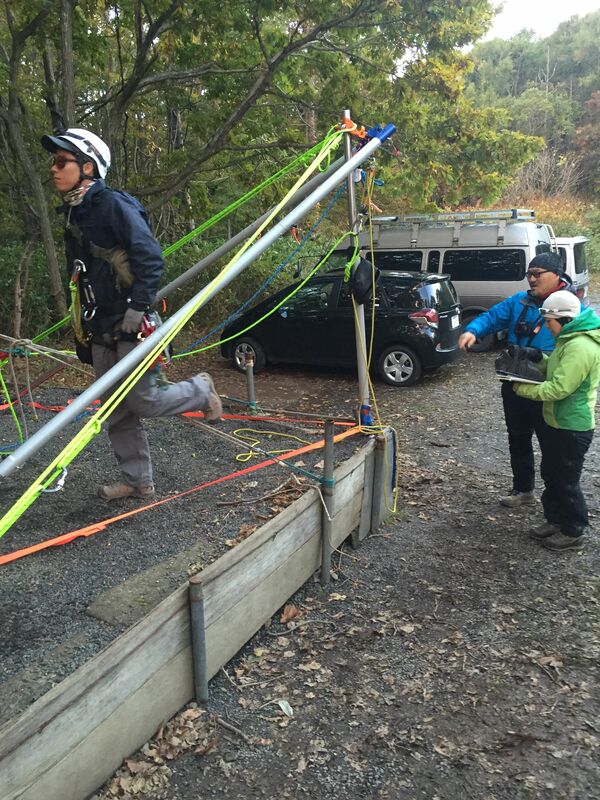 Keith and Reed Thorne were the instructors for this training. The Arizona Vortex was used extensively throughout the class and on one particular day, we visited the brand new Los Alamos Civic Center which had just been opened after construction. 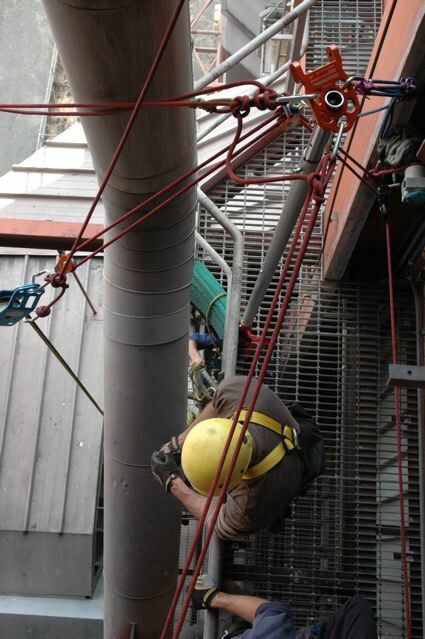 We had to be very careful with the many elevator shaft openings which were brand new. 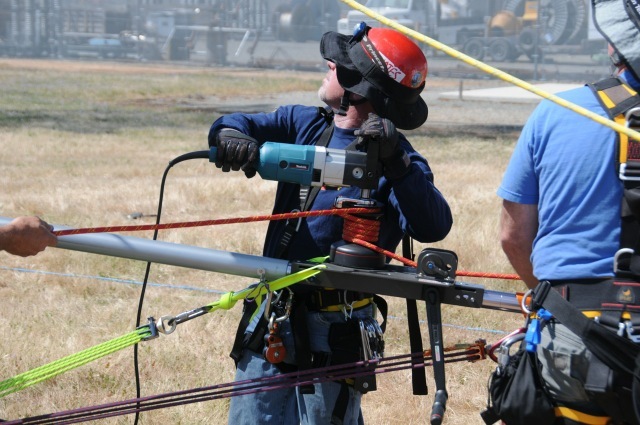 The capstan winch is the "Classic" from Skyhook® used with the Makita power head. 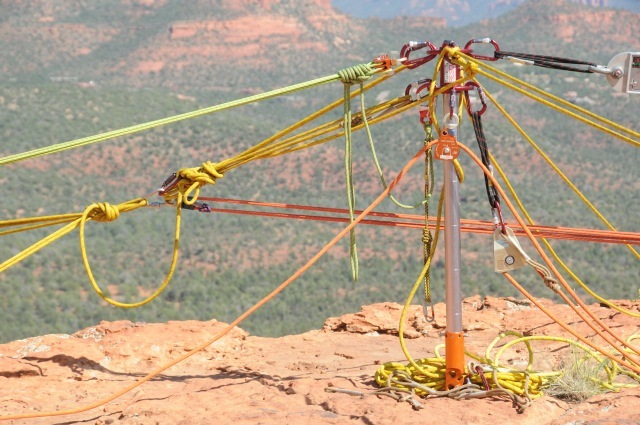 The AZORP which stands for "Arizona Omni Rigging Pod"
A typical focused floating anchor (with a single leg compression member) made from the old Wren Industries Version 1 Arizona Vortex gin pole "red head". 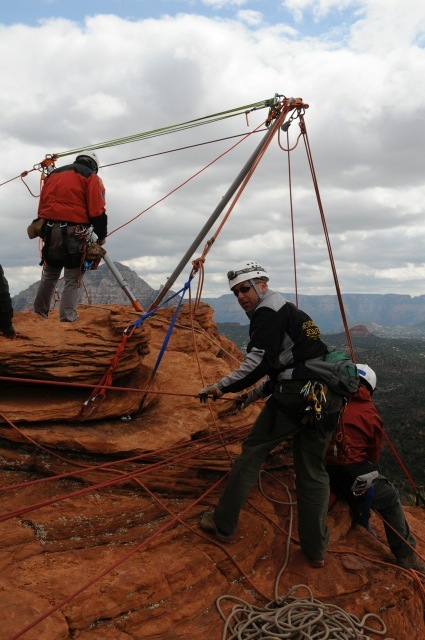 This during the very first OHRW (Offset Highline Rescue Workshop) offered by Ropes That Rescue in 2010 in Sedona, AZ. 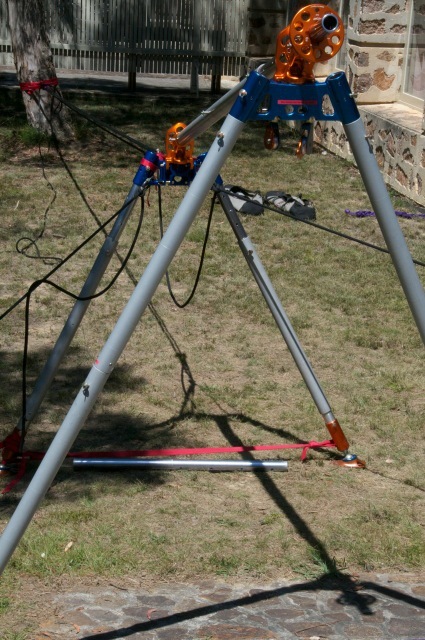 An early focused floating anchor (with a single leg compression member) made from the old Wren Industries Version 1 Arizona Vortex gin pole "red head". 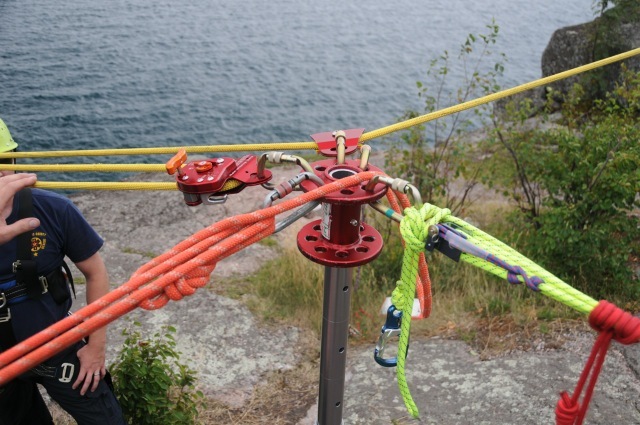 Photo taken during TSRW (Team Skills Rescue Workshop) for the St. Louis County SAR team training near Duluth, MN in 2011. 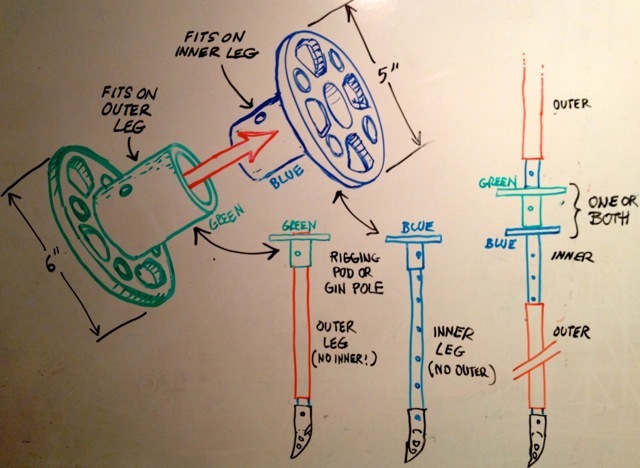 This is the 2012 conceptual white board drawing by Reed Thorne in discussions with Rock Thompson of Rock Exotica concerning the AZORP. 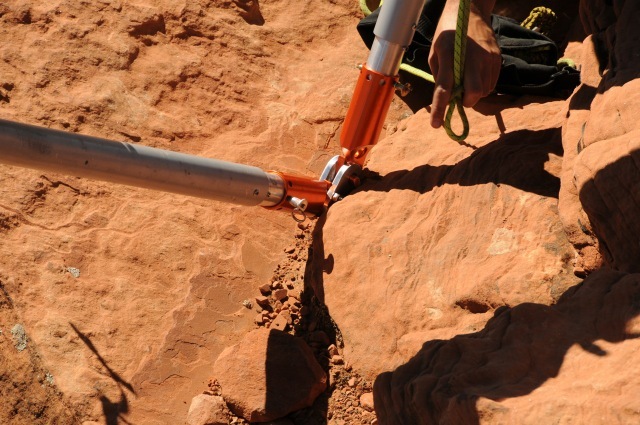 Originally called the "AZPOD" by Thorne, but later changed with input from Rock. Most of the creations start on the white board as a sketch like this. Rock loved the idea of making two parts to the AZORP each with no welds required. By making in two halves, each can be used separately unlike the old Wren "red head". 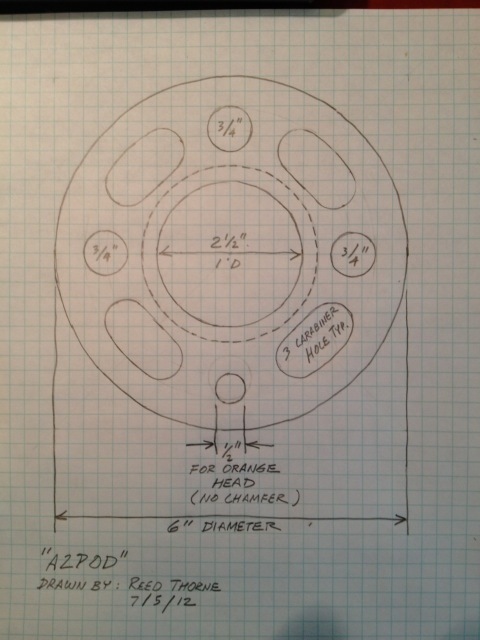 These are the 2012 drawing by Reed Thorne in discussions with Rock Thompson of Rock Exotica concerning the AZORP. 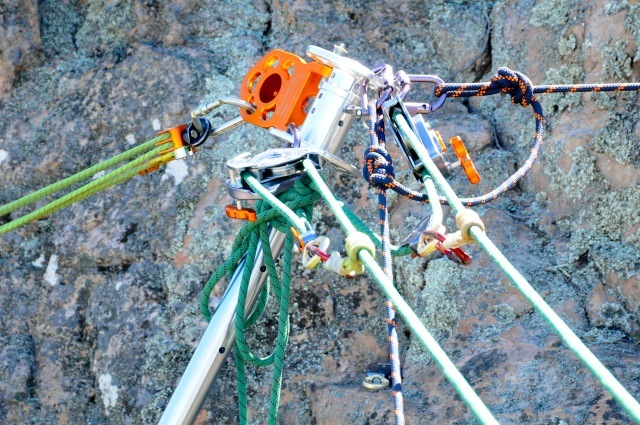 Originally called the "AZPOD" by Thorne, but later changed with input from Rock. Rock loved the idea of making two parts to the AZORP each with no welds required. By making in two halves, each can be used separately unlike the old Wren "red head". 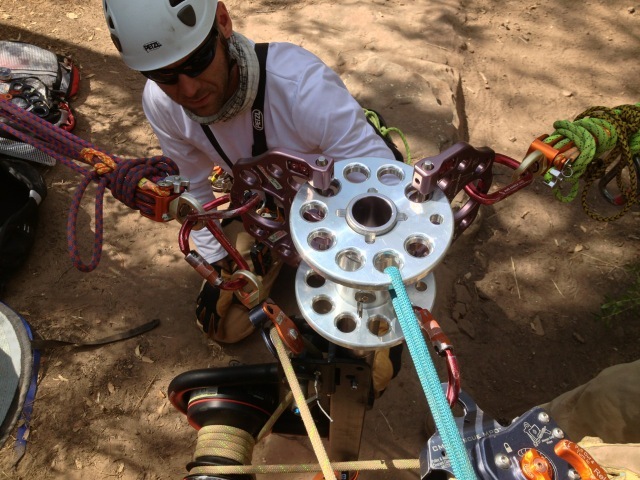 This is the very first AZORP prototype assembled with the Arizona Vortex gin pole head installed between the flanges. The oblong holes which allowed the AZORP to shift left or right during loading were decided against in the final version. 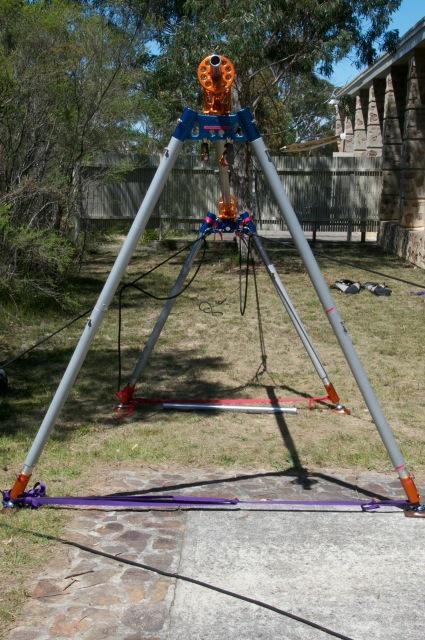 Second AZORP prototype by Rock Exotica used in RTR program by students. 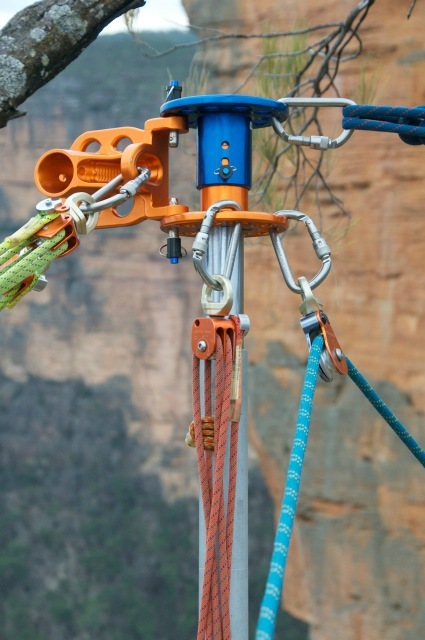 The first version had oblong holes which would accept up to three carabiners. This had advantages but several disadvantages as well. 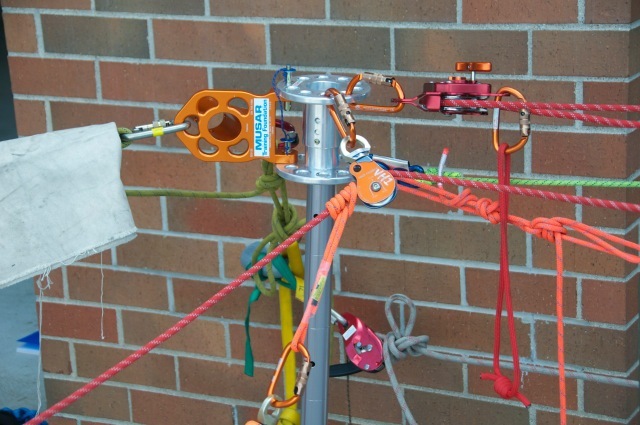 The second version (seen here) had only round holes which would accept one carabiner. This was finally settled for the final AZORP design by Rock/Reed. 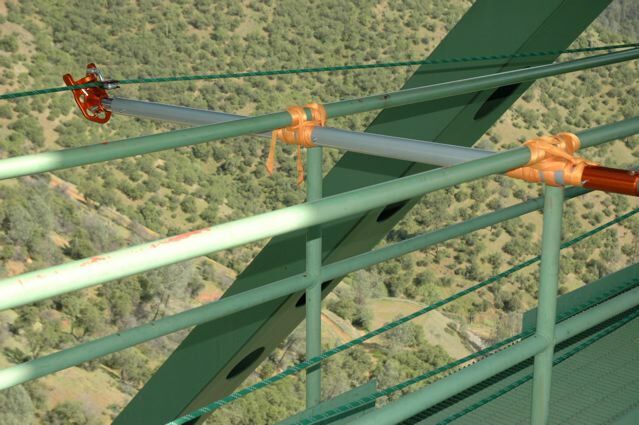 Note the use of two Rock Exotica "BOLTS" as the bridging structure between the two AZORP flanges. 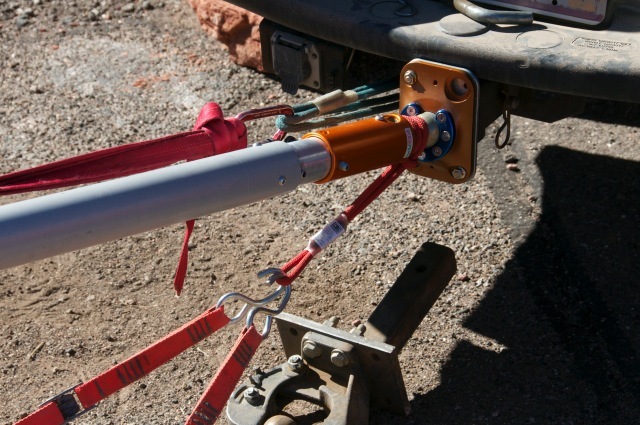 The capstan winch is also seen on the single inner leg of this rigging pod. 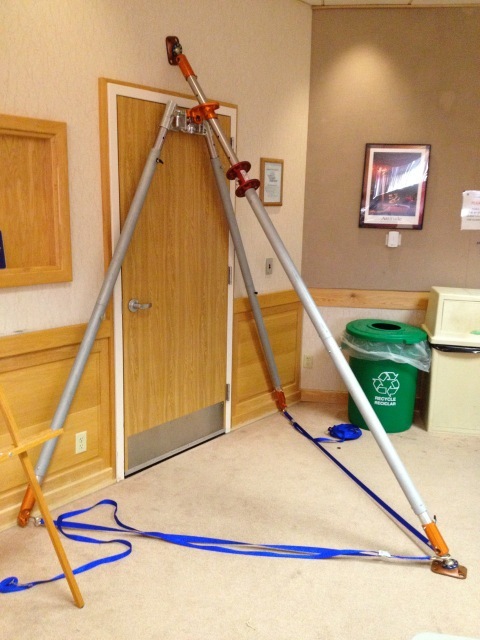 This photo of a clean focused floating anchor using the second prototype AZORP with single AZ Vortex leg from the 2013 AHDW (Artificial High Directional Workshop) in Lansing, Michigan with RTR Lead Instructor Dave Van Holstyn, and Reed and Keith Thorne. 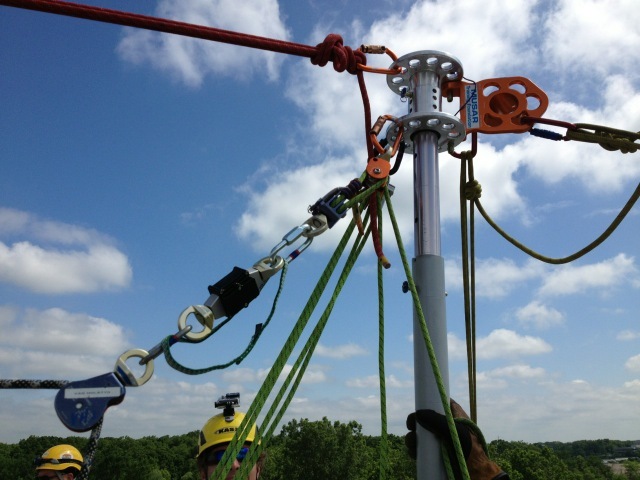 Another photo of a clean focused floating anchor using the second prototype AZORP with single AZ Vortex leg from the 2013 AHDW (Artificial High Directional Workshop) in Lansing, Michigan. 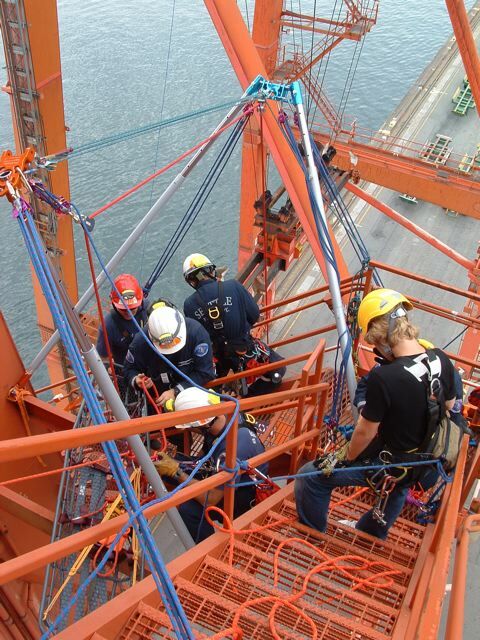 Both flanges of the AZORP were used for this A frame luffing exercise. 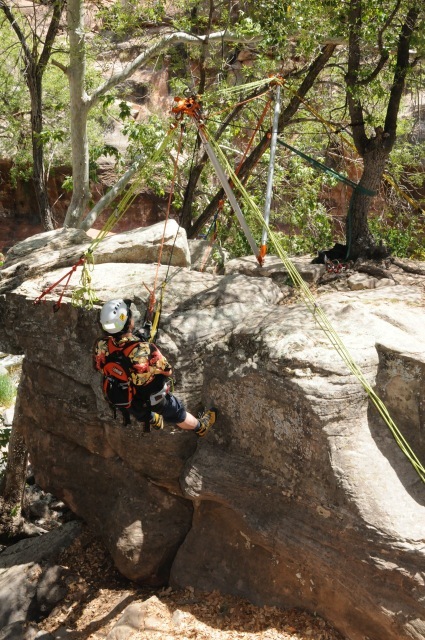 The Inner AZORP head being used as a focused floating anchor in the 2014 OHRW (Offset Highline Rescue Workshop) in Jerome, Arizona. 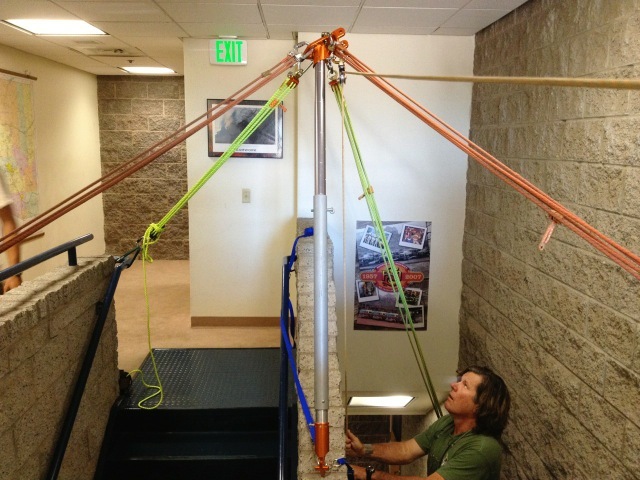 Jerome Hotel Jamb Pole during the 2014 AHRW (Artificial High Directional Workshop). 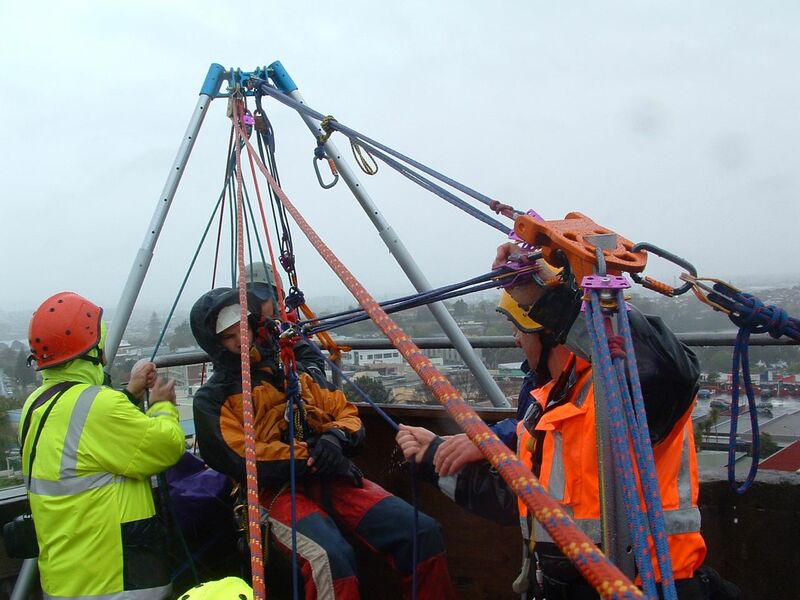 Students are securing the pole with backties and front ties to keep it in position for the 'Doortex' operation to left. 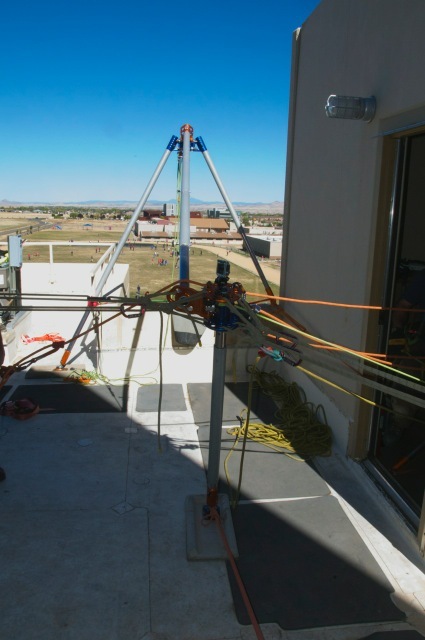 The Los Alamos NM Fire Dept during a contract Ropes That Rescue program using an AZORP inner flange on an Arizona Vortex leg secured on the base plate of one wall (left) and held to a door frame by the black piece of webbing jambed in the door and locked (right). Very strong anchor. 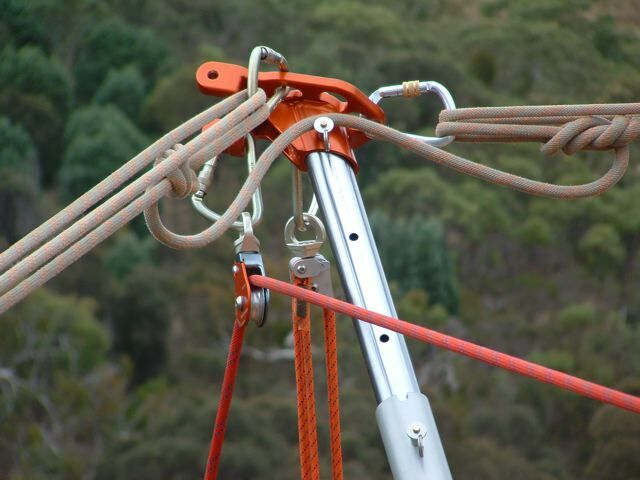 Top view of a rigging pod with Skyhook® capstan winch for raising during this Blue Mountains, Australia OHRW (Offset Highline Rescue Workshop) in 2014. 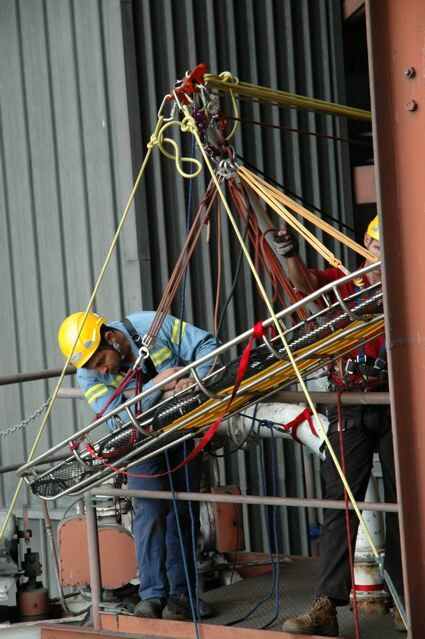 The system is a two-tensioned rope system which requires at least three backties to left. 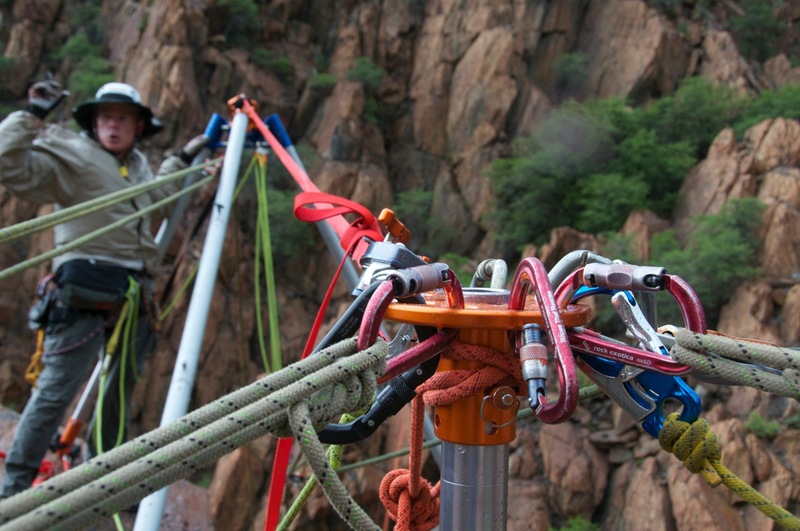 Note use of AZ Vortex gin pole head to secure both AZORP flanges. 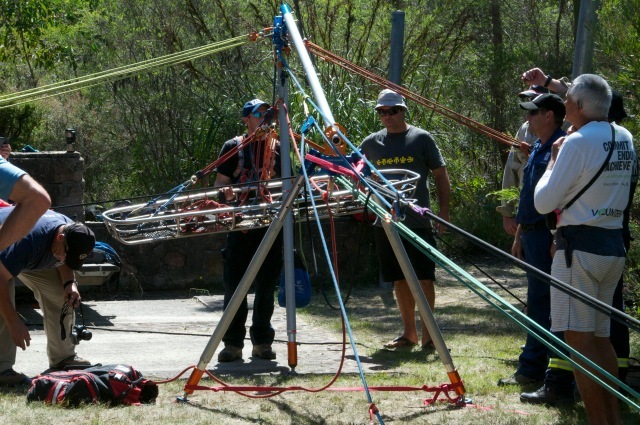 Side view of a gin pole during this Blue Mountains, Australia OHRW (Offset Highline Rescue Workshop) in 2014. 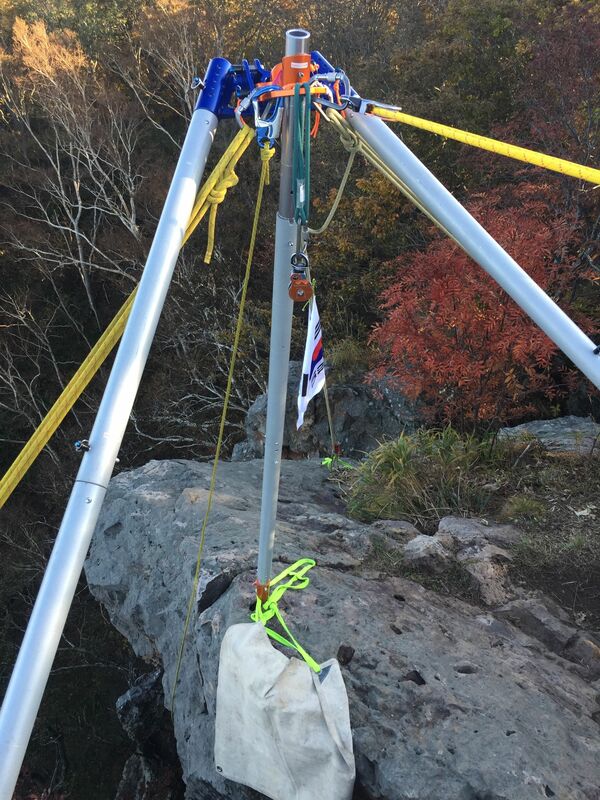 The pole is perched on the tip of "Hanging Rock" where a two rope offset was being performed. 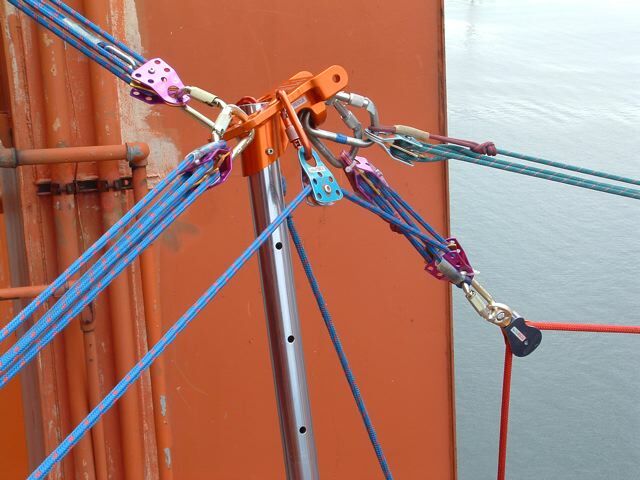 The top flange of the AZORP was used for guying and the bottom flange was for the high directional anchorage. 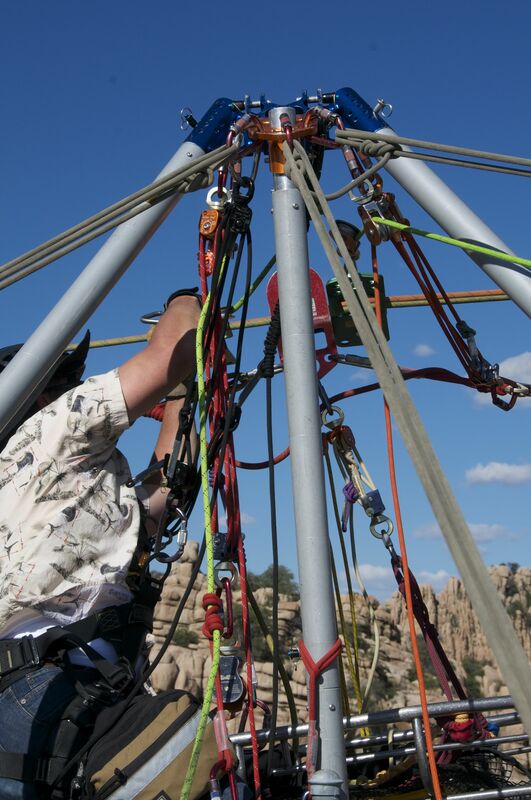 Note use of AZ Vortex gin pole head to secure both AZORP flanges. 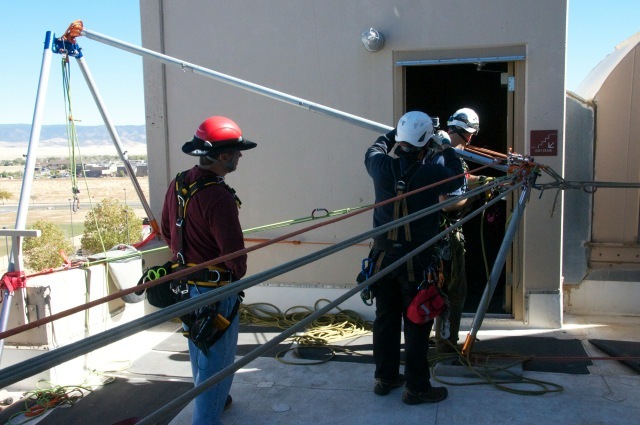 Los Alamos Fire Department (New Mexico) Technica Rescue Team practice a guyed only SA Frame and AZORP rigging pod at rear during Ropes That Rescue TSRW (Team Skills Rescue Workshop) in 2013. Reed and Keith Thorne teaching. 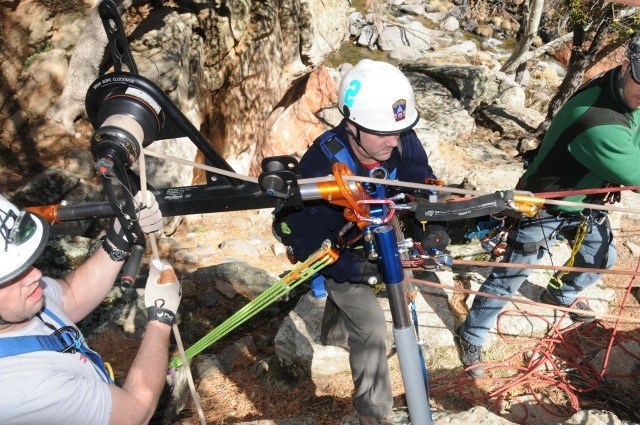 A jamb pole constructed from the AZORP prototype and AZ Vortex legs across a 100' gap at the Mohonk Preserve in New York duing MRW (Mountain Rescue Workshop) in 2013. 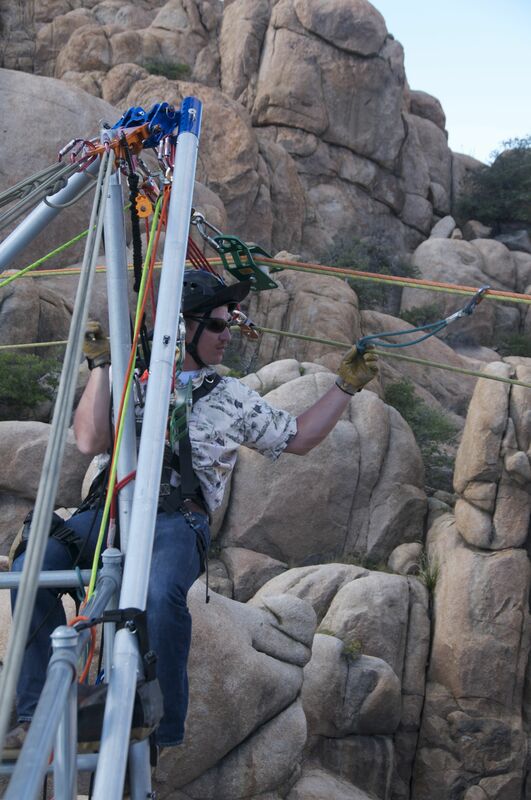 Climbing ranger, Andrew Bajardi is the attendant on this project. 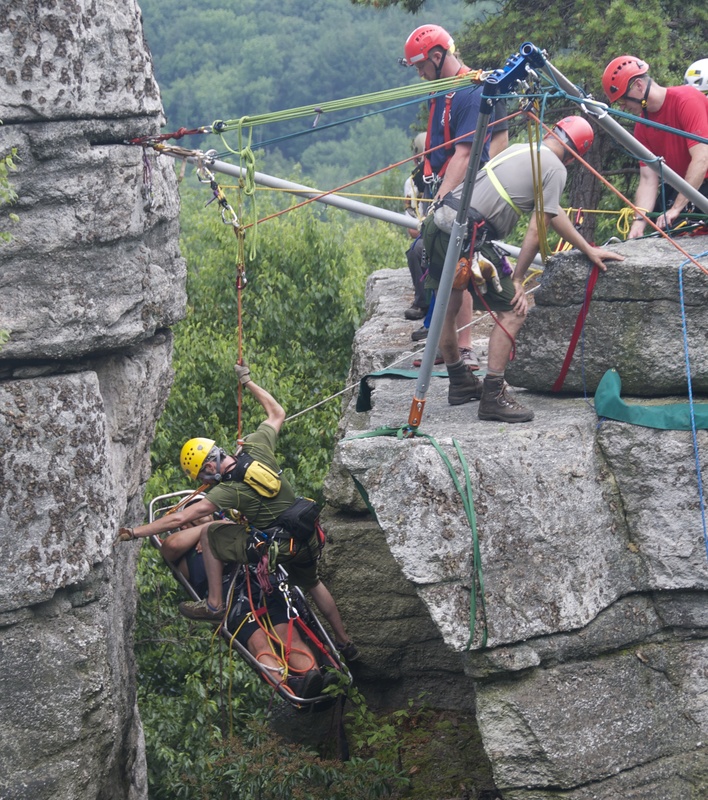 This "Gunks" program is ongoing each year at this venue. 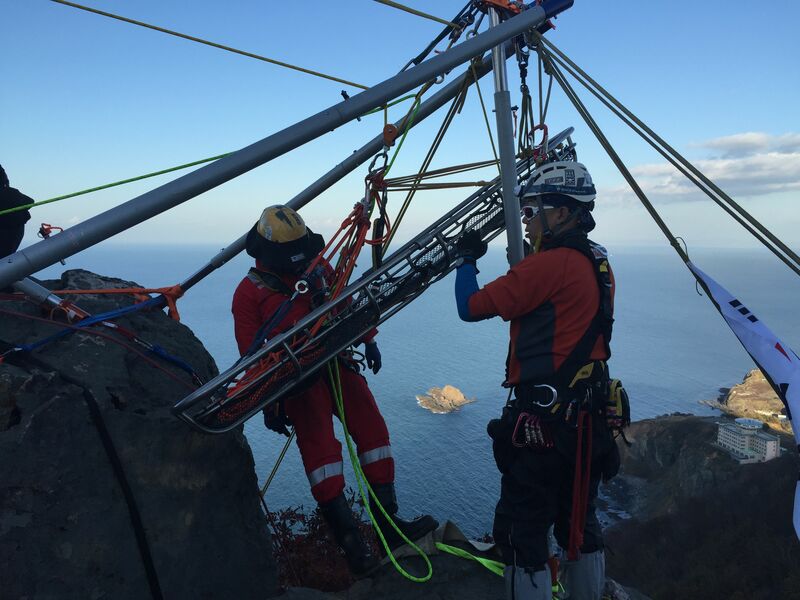 Japanese Students use a small rigging pod with AZORP and mounty the Skyhook Winch on the pole below for operation on Doe Mountain in 2012. 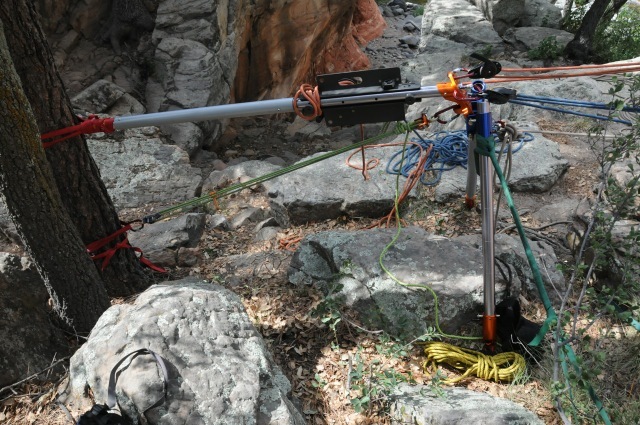 An Arizona Vortex SA Frame Skyhook® winch stand lashed to a tree at the rear (and butted up against a rock) and side guyed with rope at the front end. 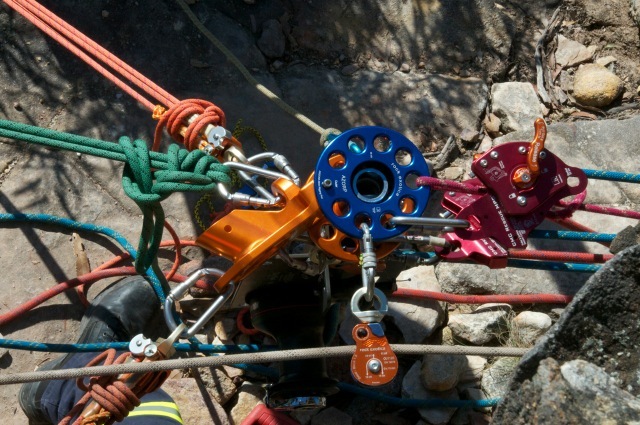 Note the AZTEk as the main anchor and not the lashing. 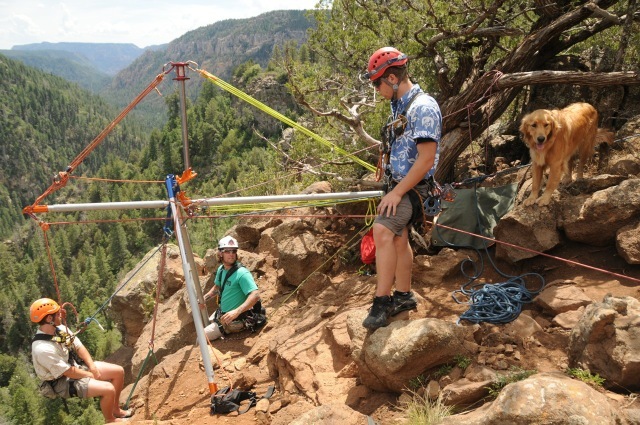 This was during the 2012 AHDW (Artificial High Directional Workshop) in Oak Creek Canyon. 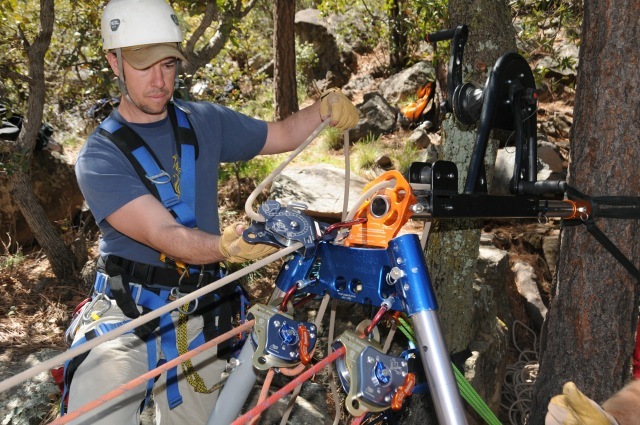 An Arizona Vortex SA Frame Skyhook® capstan winch stand lashed to a tree at the rear and side guyed with rope at the front end. 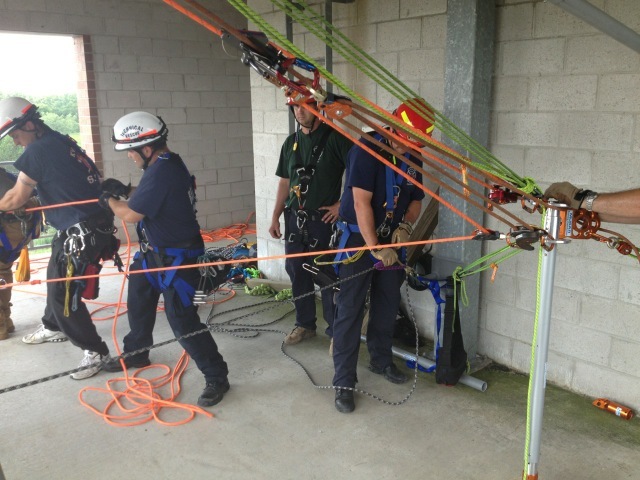 The lashing and side guys are the main anchor for this stand. 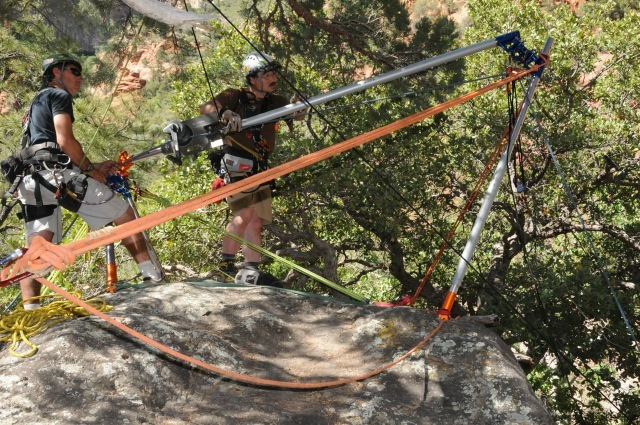 This was during the 2010 AHDW (Artificial High Directional Workshop) in Oak Creek Canyon. 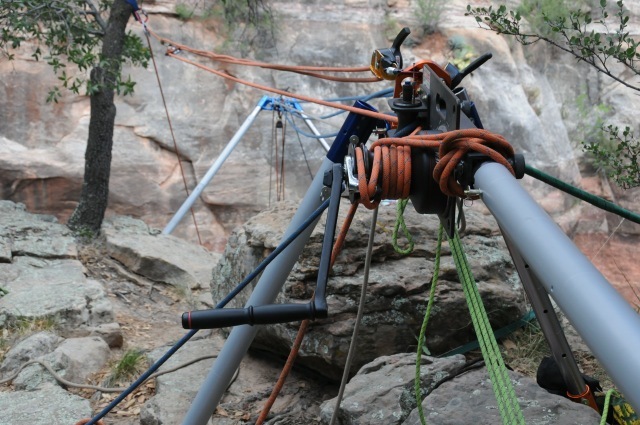 An Arizona Vortex Easel A Frame winch stand lashed to a tree at the rear and anchored with the AZTEk as the main anchor and not the lashing. 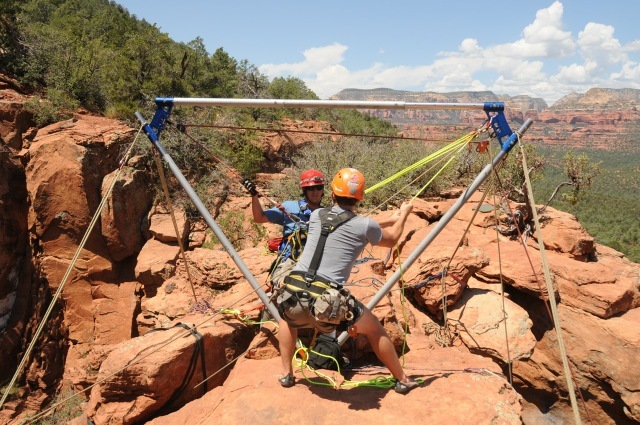 This was during the 2012 AHDW (Artificial High Directional Workshop) in Oak Creek Canyon. 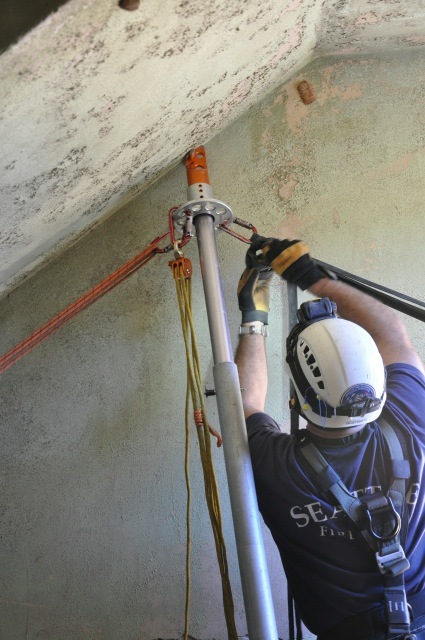 The winch is the "Classic" capstan winch from Skyhook®. 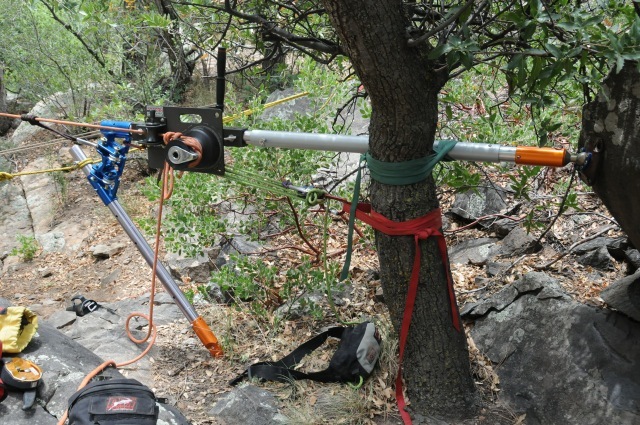 An Arizona Vortex Easel A Frame winch stand lashed to a tree at the rear and anchored with the AZTEk as the main anchor and not the lashing. 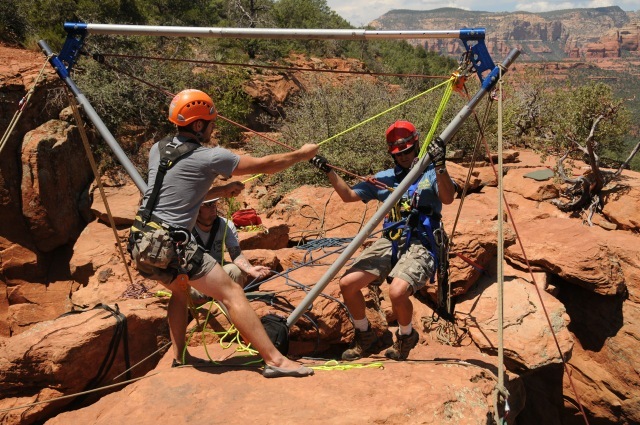 This was during the 2012 AHDW (Artificial High Directional Workshop) in Oak Creek Canyon. 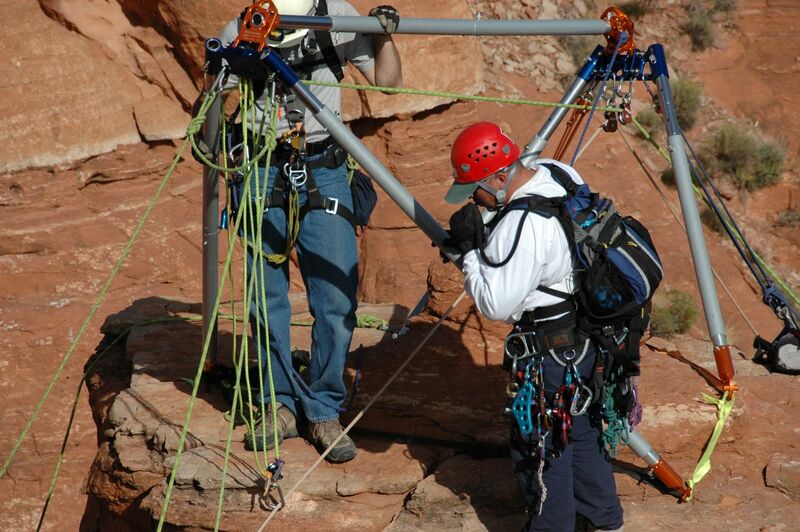 The winch is the "Classic" capstan winch from Skyhook®. 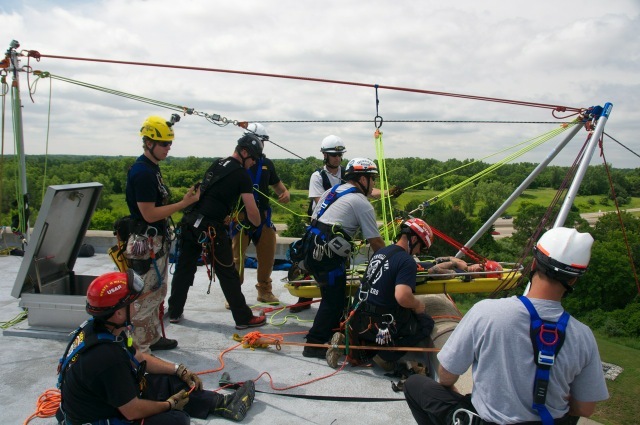 This photo appears on the Skyhook® main web site from an RTR program. 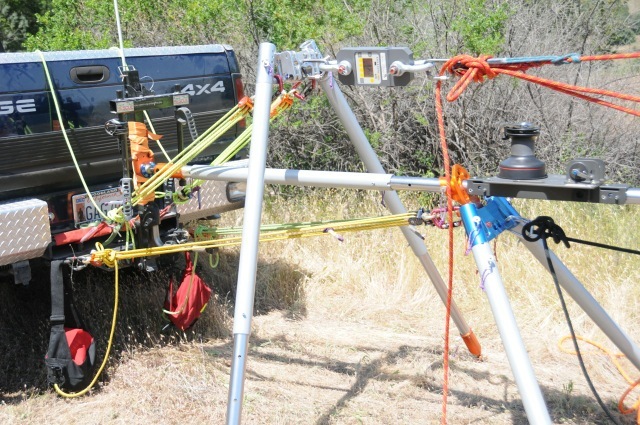 Skyhook® Capstan Winch stand from easel A frame mounted on the rear of a fire utility vehicle. 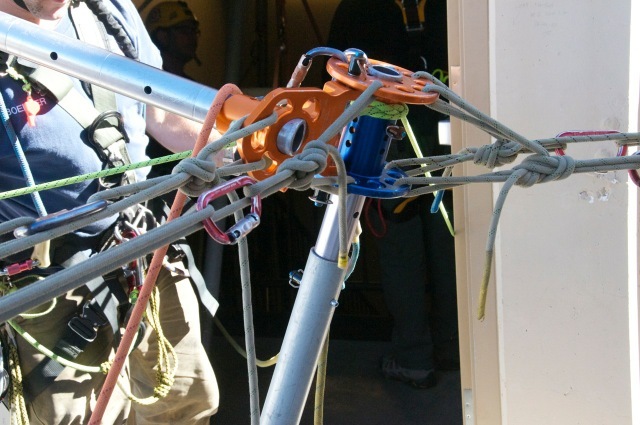 This was used during the STRW (Structural Tower Rescue Workshop) in Sedona in 2014 at Sedona Fire District. 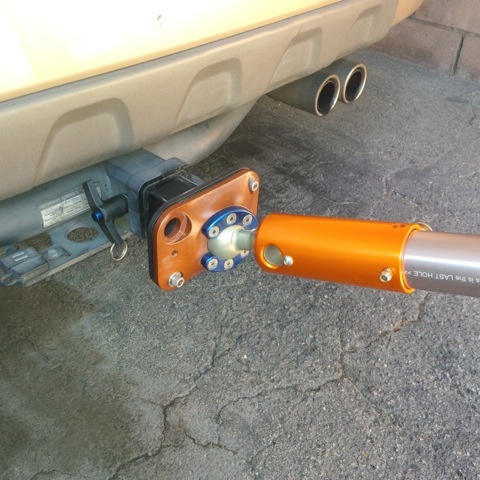 Skyhook® Capstan Winch Square Trailer Hitch Adaptor only available from Skyhook®. 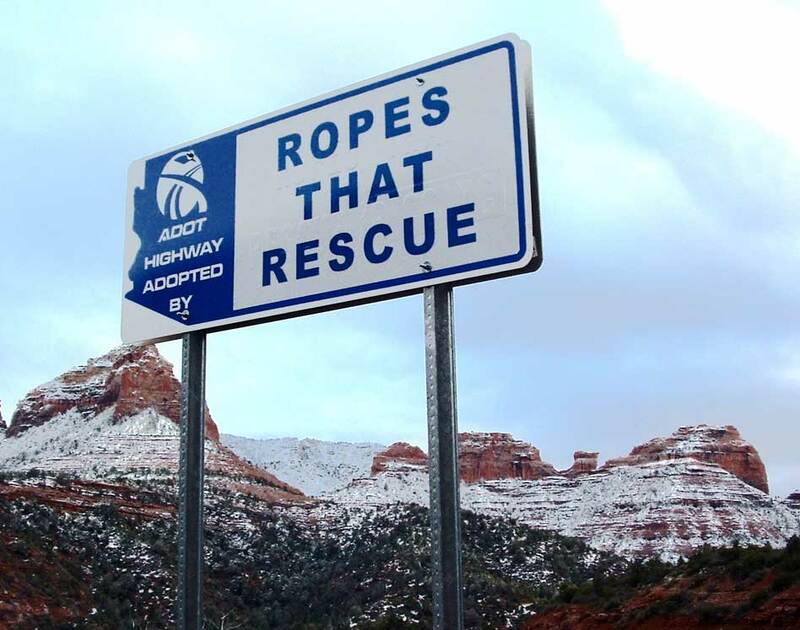 A very nice idea! 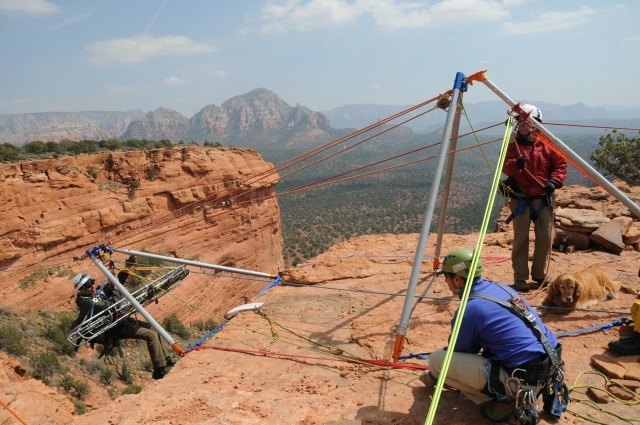 This was used during the STRW (Structural Tower Rescue Workshop) in Sedona in 2014 at Sedona Fire District. 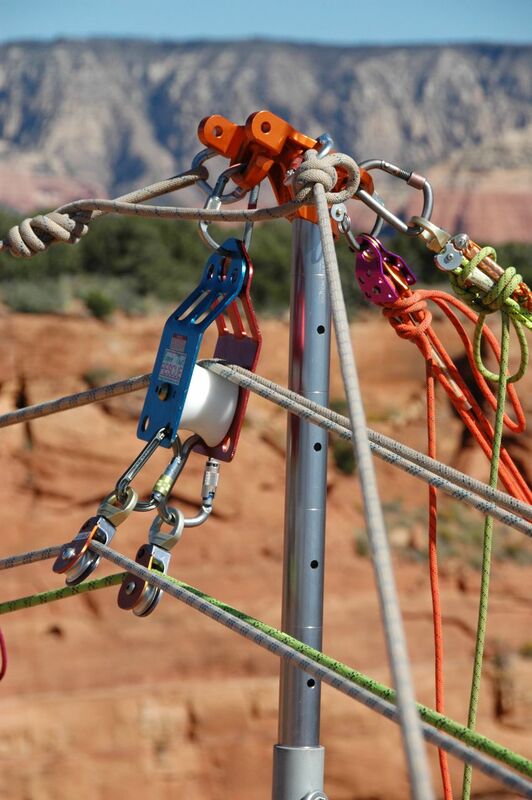 Arizona Vortex Leg Bumper Mount made by Skyhook® only. 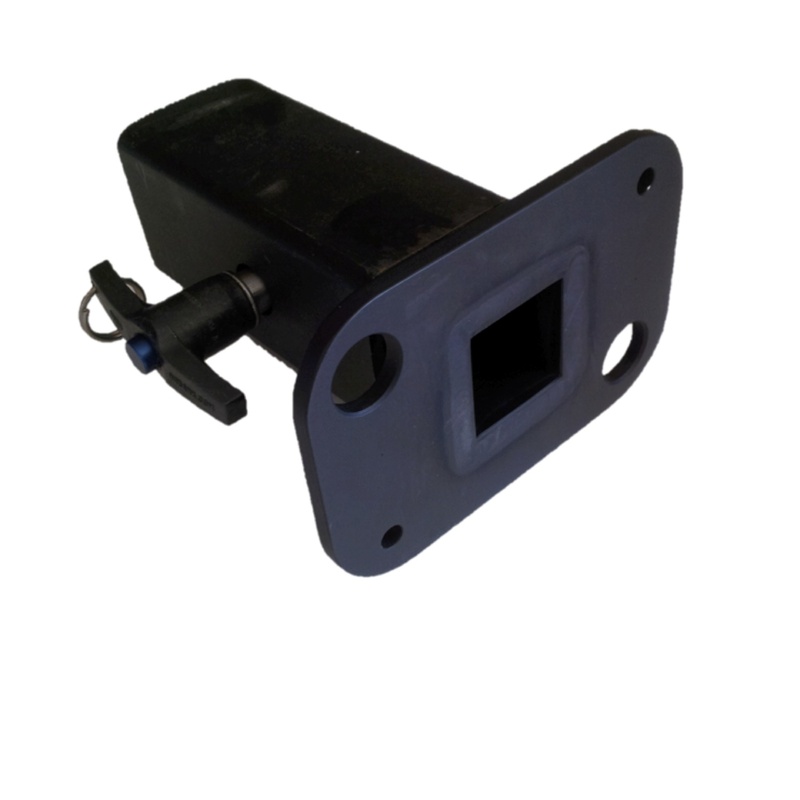 AZ Vortex Leg Bumper Mount made by Skyhook® only. 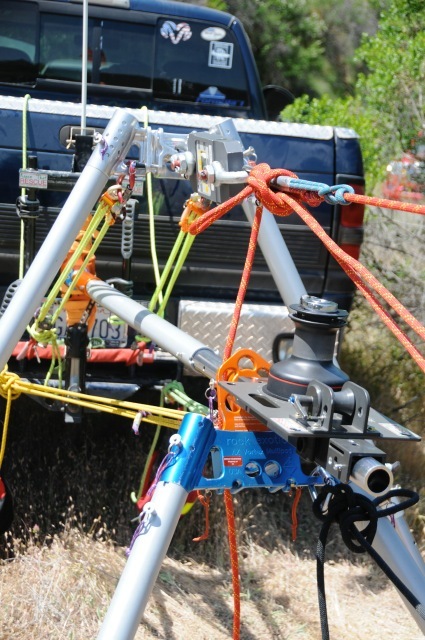 Skyhook® capstan winch stand from easel A frame mounted on the rear of a pickup truck at WAPA yard. 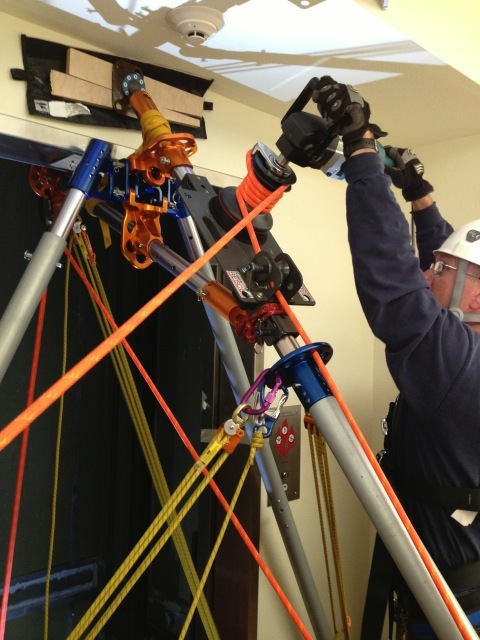 This was used during the STRW (Structural Tower Rescue Workshop) in 2012 at Roseville, California. 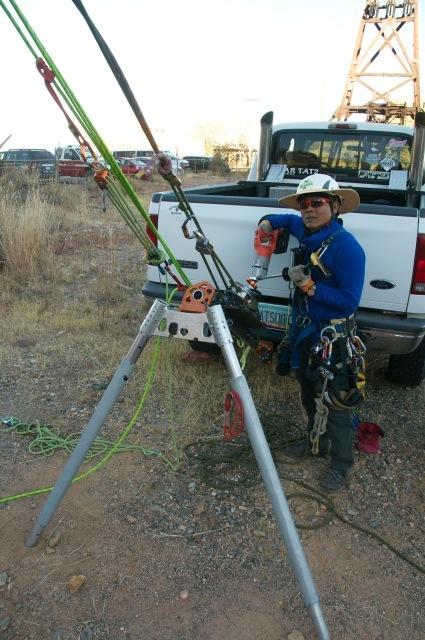 Skyhook® capstan winch stand from easel A frame mounted on the rear of a pickup truck at WAPA yard. 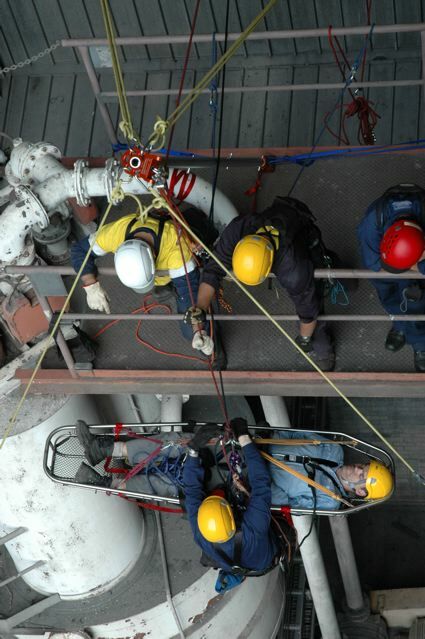 Note main anchor from AZTEK. 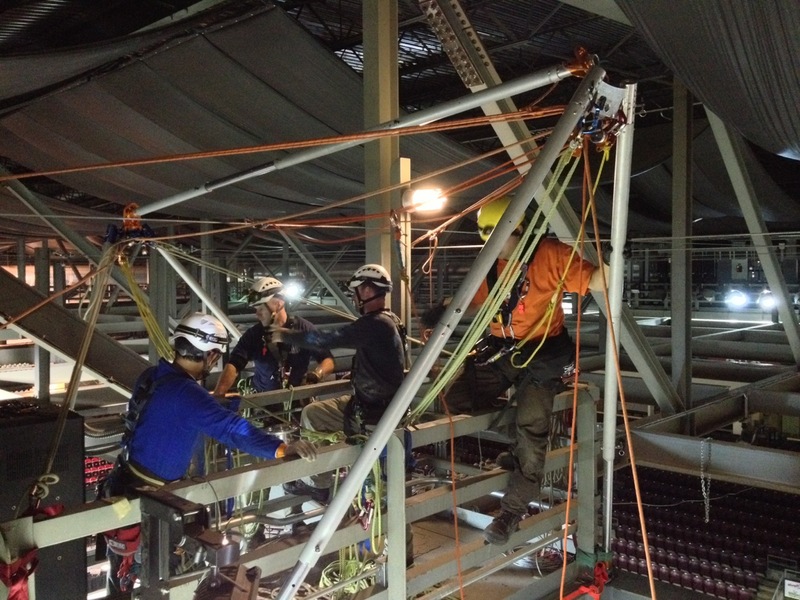 This was used during the STRW (Structural Tower Rescue Workshop) in 2012 at Roseville, California. 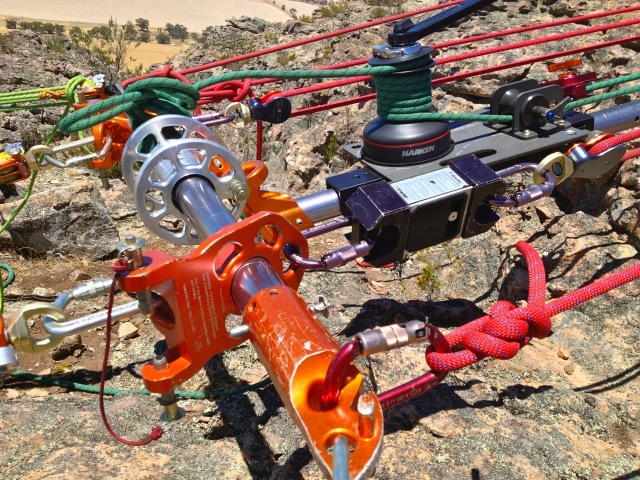 Students used the two orange gin pole heads of two Arizona Vortex kits to construct this small SA frame Skyhook® winch stand for the MRW (Mountain Rescue Workshop) in Prescott's Granite Dells in 2014. 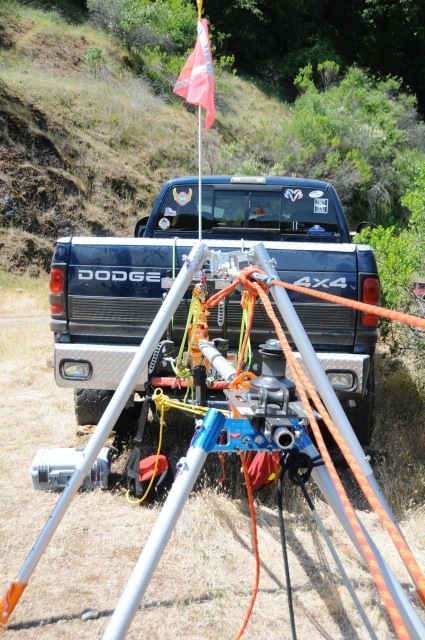 Skyhook® capstan winch stand from easel A frame mounted on the rear of a pickup truck. 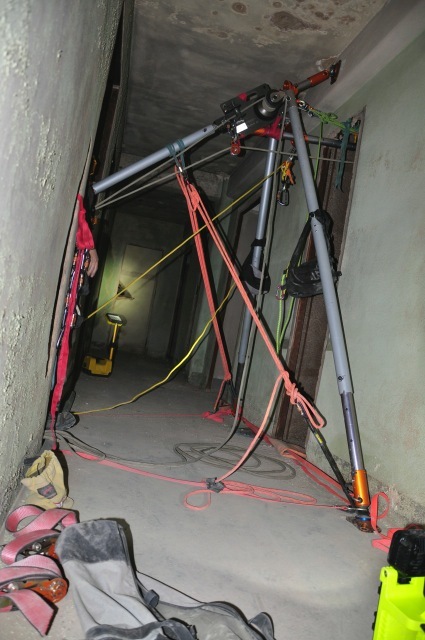 This was used during the STRW (Structural Tower Rescue Workshop) in 2014 at Jerome Fire. 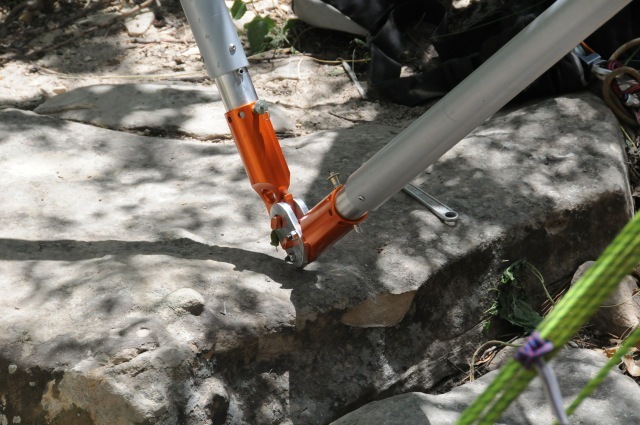 Skyhook® "Trail Tech" winch has two arms on either side like a bicycle. 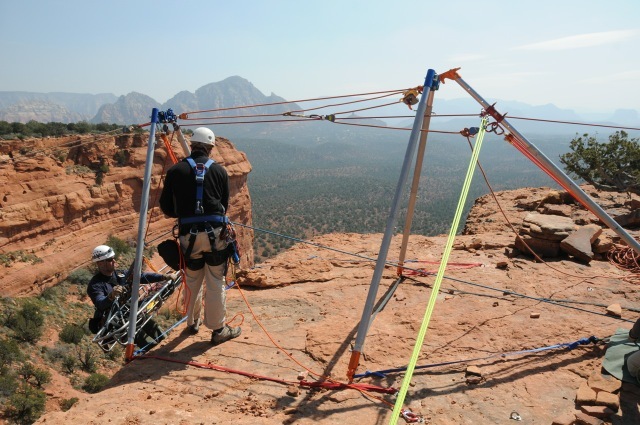 This is the lightweight version for mountain and backcountry rescue teams. 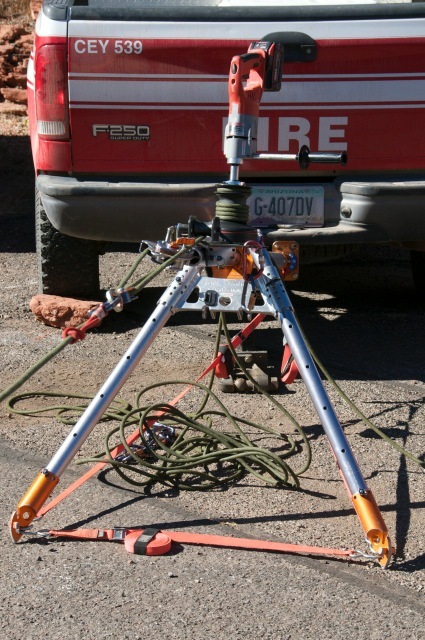 It cannot be used with power equipment like the "Classic" style winch seen in other RTR programs. 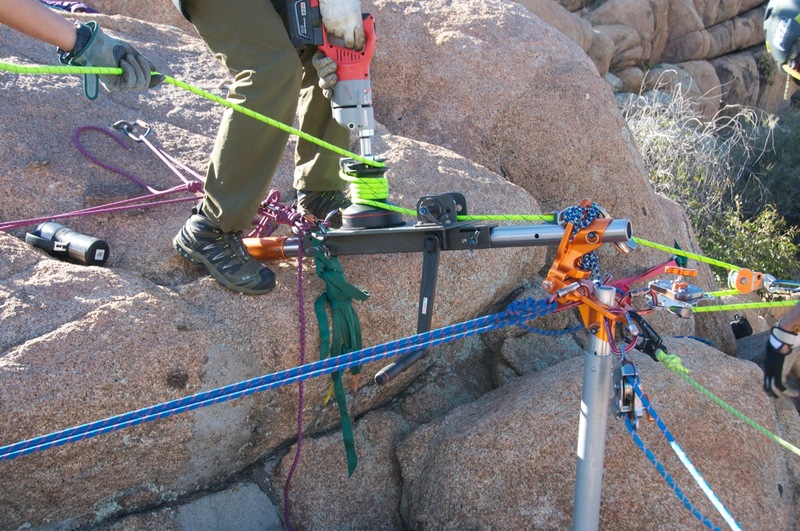 The Arizona Vortex 'Doortex' used with Skyhook® capstan winch in Los Alamos, New Mexico during custom RTR program there in 2013.